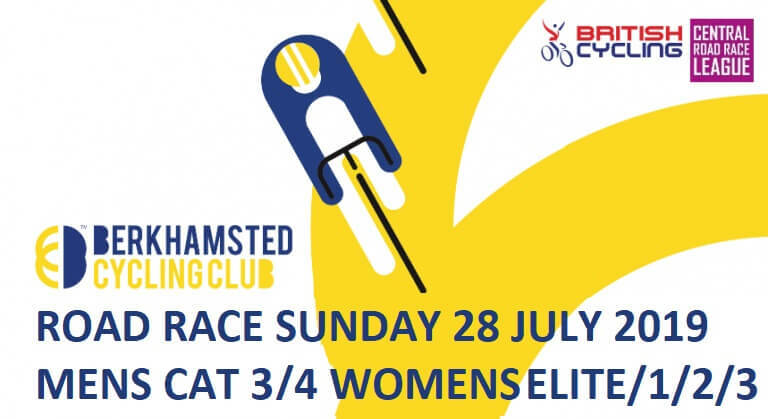 BCC Road Race Sunday 28th July 2019. Races are men’s cat 3/4 and women’s cat Elite/1/2/3. The men’s 80km race starts at 9:30 and women’s 70km at 13:30. The course is the short 6.6km Mentmore loop which the men do 12 times and women 10. Sign-on for men opens at 8:30 with briefing at 9:15. Women’s sign-on opens at 12:30 with briefing at 13:15. Click here for British Cycling online entry. 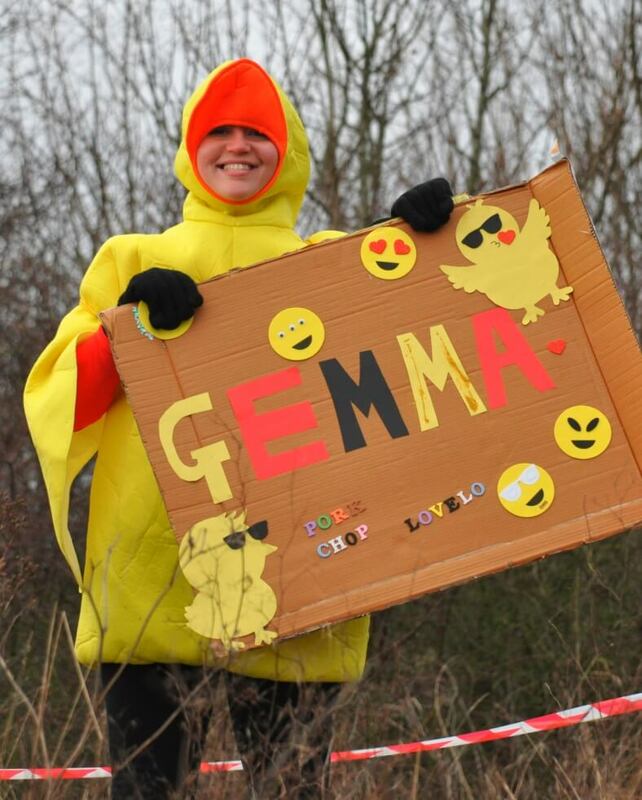 This page will be updated nearer race day so check back for news. Click here for the route on Ride with GPS. 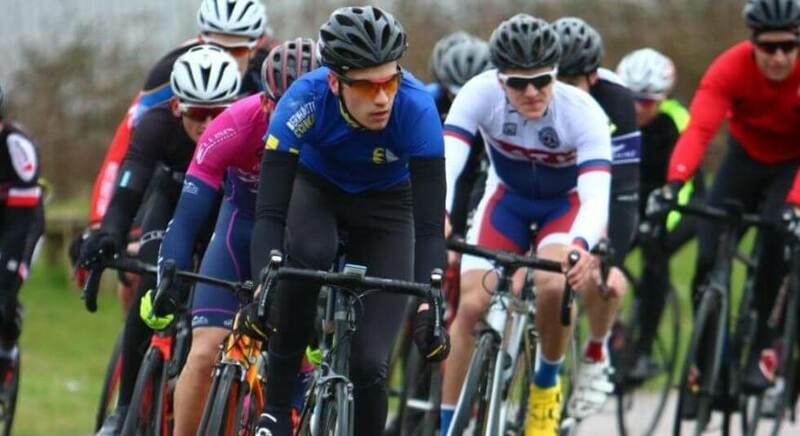 BCC Performance Academy racers will be in the line-up so please come along to cheer them on! As the course is a short loop spectators will get to see lots of the action. 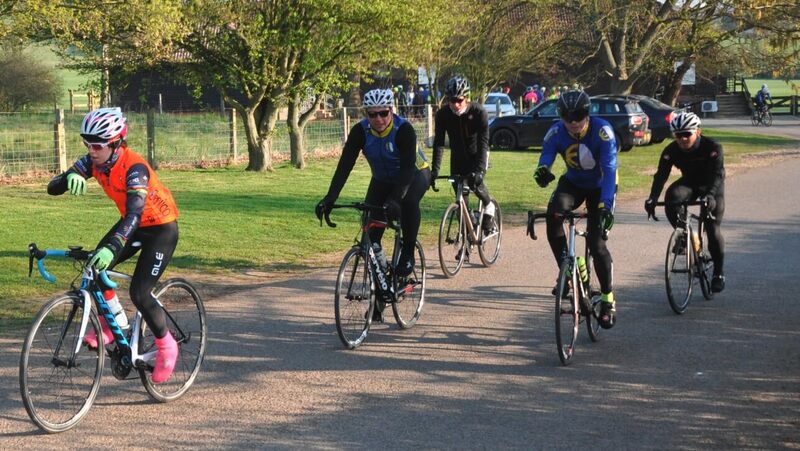 Please refer to the Central Road Race League and British Cycling websites for FAQ’s and rules. 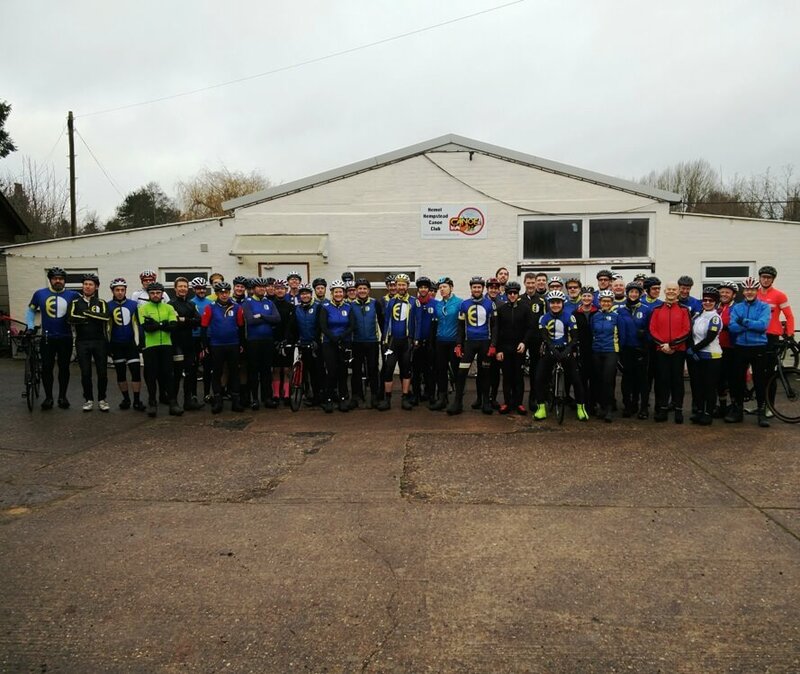 As the weather starts to improve more club cyclists are enjoying our Saturday morning ride and we have a new club record with 230 members. 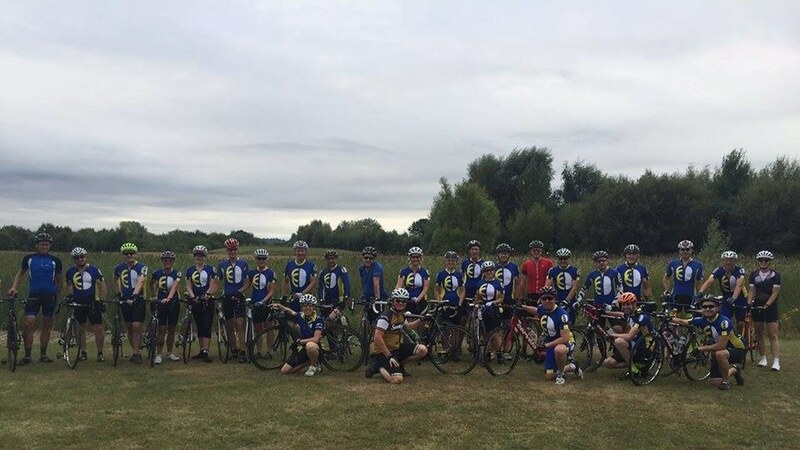 The club caters for most levels of cyclists and as long as you can maintain an average speed of 19 kmh (12 mph) and have a road bike then head over to our membership pages for details of how to join. 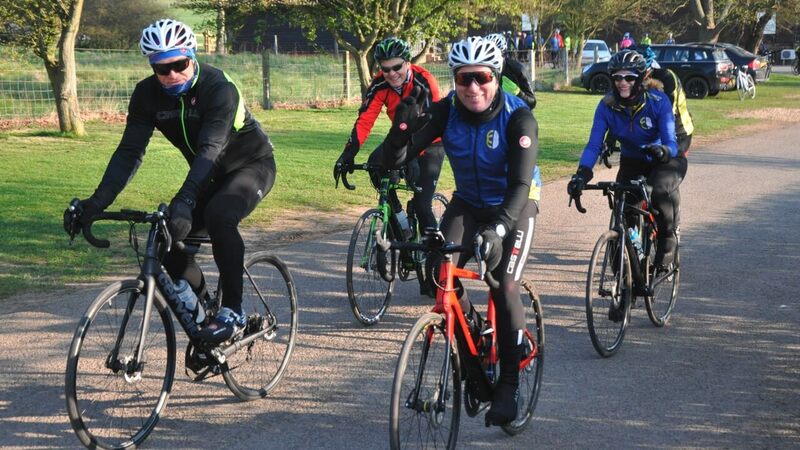 Along with the different speed group Saturday morning rides we have introduced a training focused ride for members that want to improve or re-gain performance in preparation for Sportives or events later in the year. These rides have been designed by our Performance Officer (also a triathlon coach) in conjunction with our Ride Coordinator. For faster riders and club racers the early (7:00am) Saturday ride has recently included riders from other clubs. 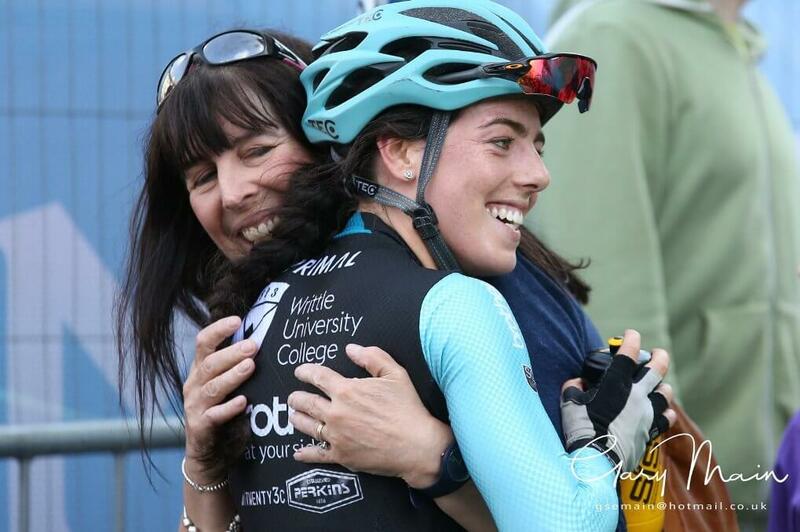 Notably Alice Lethbridge the Cycling Time Trial Women Best British All-Rounder along with other national level racers. 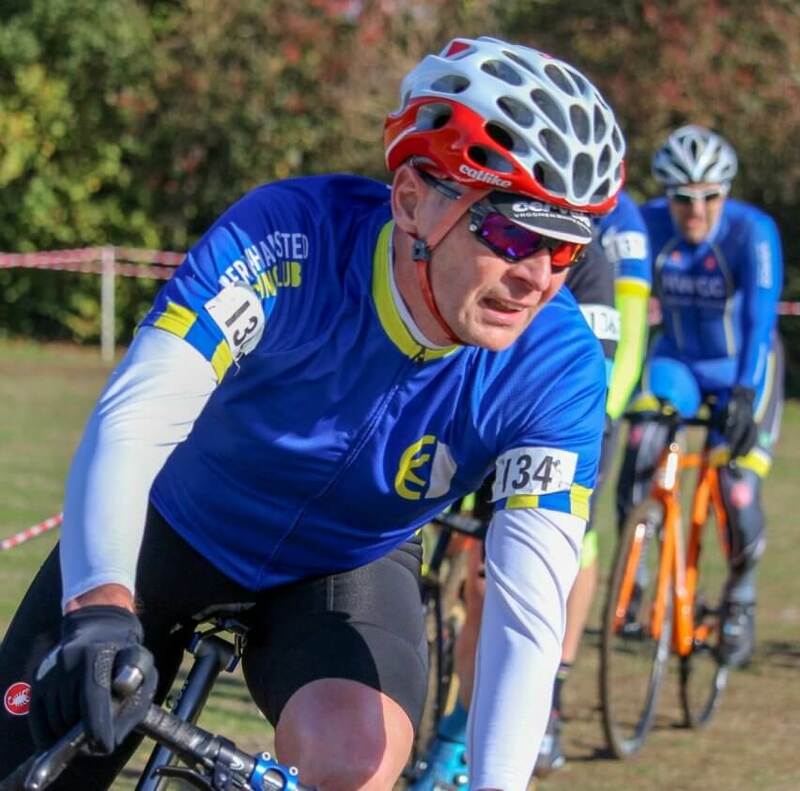 The early ride is a great way for like minded riders to team up/chain-gang around the Chilterns challenging terrain. 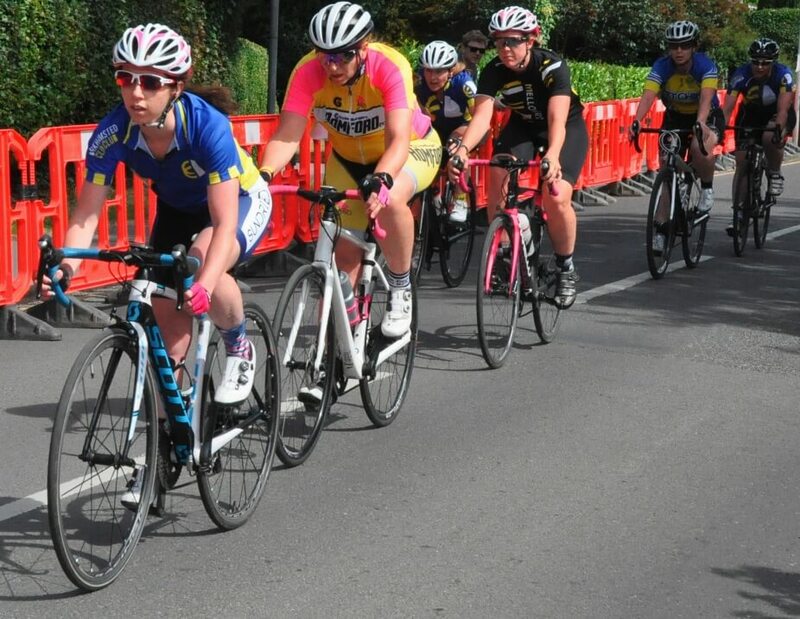 The club have lots of events planned for 2019 with social events, sportives (local and further afield) and hosting a road race (with picnic) along with a time trial and hill climb later in the year. That’s over 152 times up Everest and almost 5 times around the world! To be part of our award-winning club and enjoy the spring/summer weather in some of the best countryside close to London click here for our membership details. 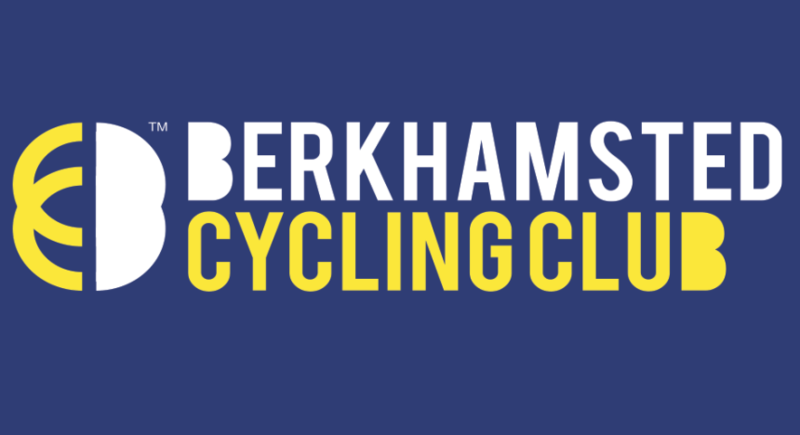 *Update* Verulam Cycling Club have won the Berkhamsted Cycling Club Spring Classic Trophy with Leighton Buzzard Triathlon Club in second place. 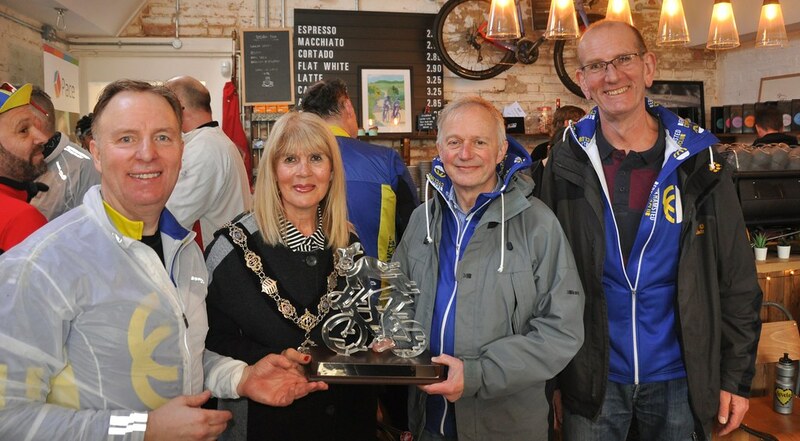 Chapeau to all riders in very windy riding conditions and to the Committee (especially Paul Molyneux) and Musette Cafe for organising a memorable event. 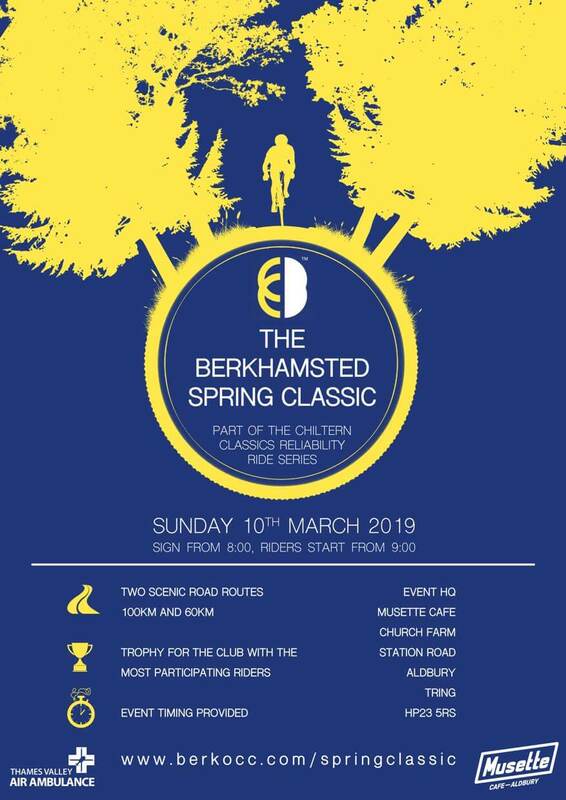 The event takes place on Sunday 10th March 2019, sign on opens from 8:00, first riders are off at 8:30. 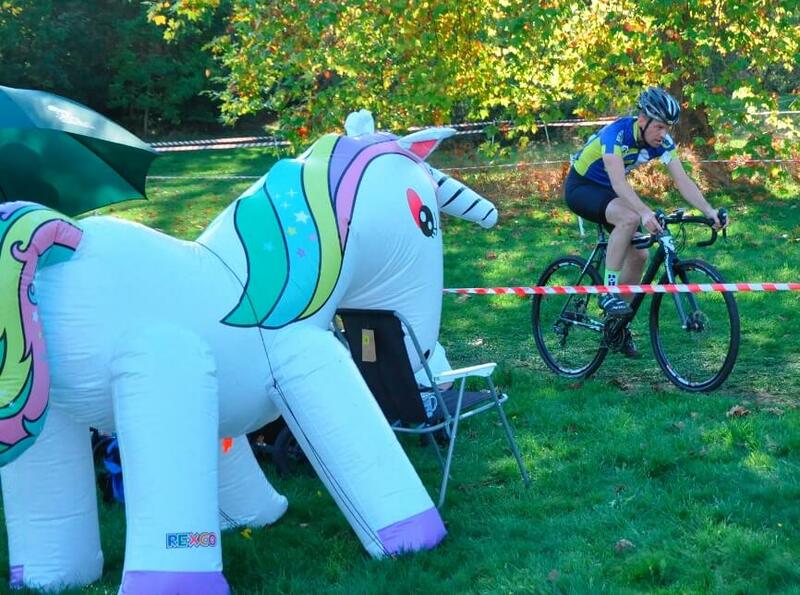 The event provides a choice of two routes through the stunning Chiltern countryside. Our objective when creating these routes was simple: not the longest, not the hardest, not the hilliest: just the best the area has to offer – a great day out the bike. The longer route takes in a beautiful loop through the Vale of Aylesbury, past the historic Waddesdon Manor and then back via a challenging climb up Aston Hill. The shorter loop shares its outward leg with the longer route before splitting off at 35km and avoiding Aston Hill. **Please note that due to roadworks on Stocks Lane the start of the ride now includes Toms Hill and both routes are slightly shorter with less climbing. 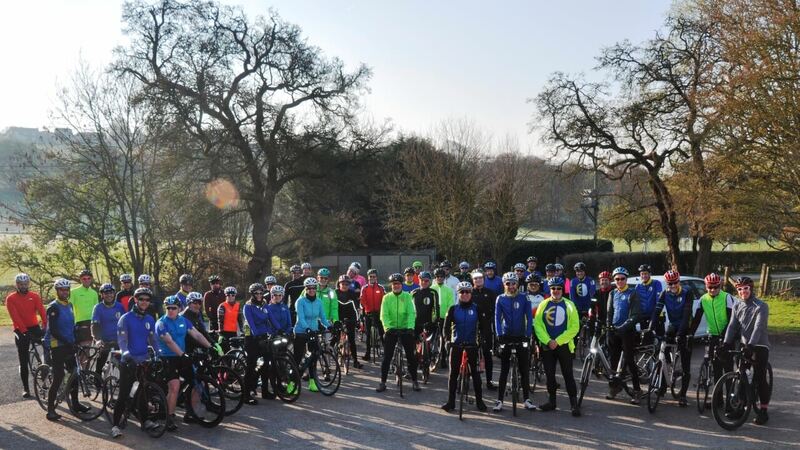 Reliability rides are self supported organised rides of a pre-planned course. Riders are expected to navigate the route themselves and to complete the course without external assistance, other than from other riders. The event will be timed via chip timing, provided on the day. 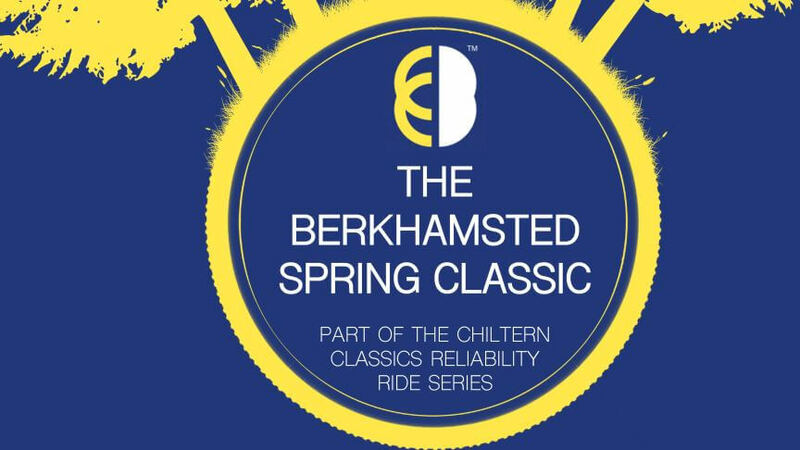 The event will include a competition for the unique, handmade Berkhamsted Spring Classic Trophy. 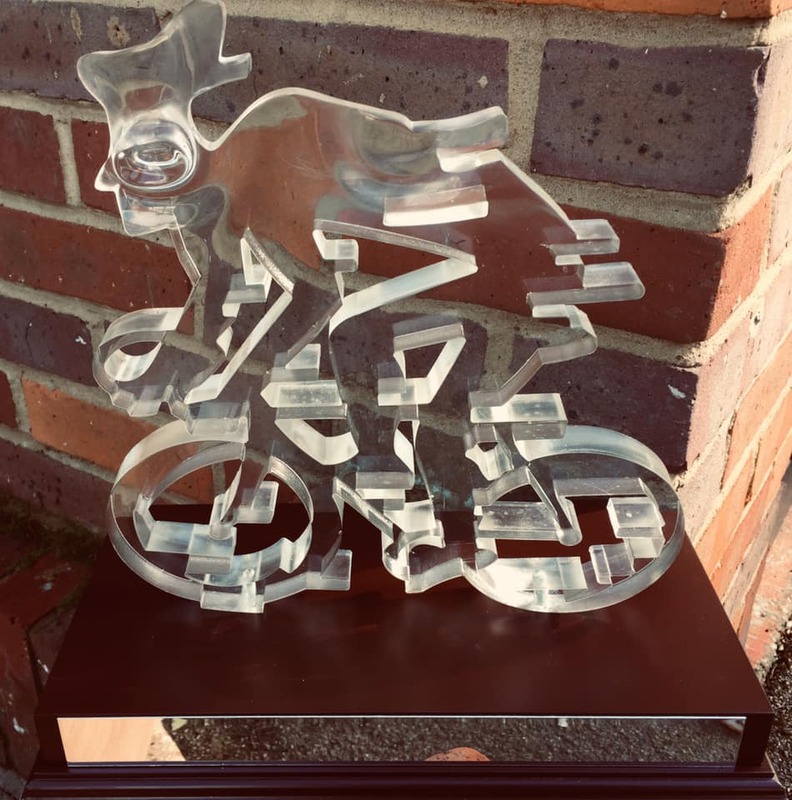 Each rider who completes the long route scores one point, each rider completing the shorter route gets half a point, the club with the most points will hold the trophy for a year, until the next event, when the trophy will return to be awarded again. BCC are excluded from the competition as the hosting club. Will your club be the winners? 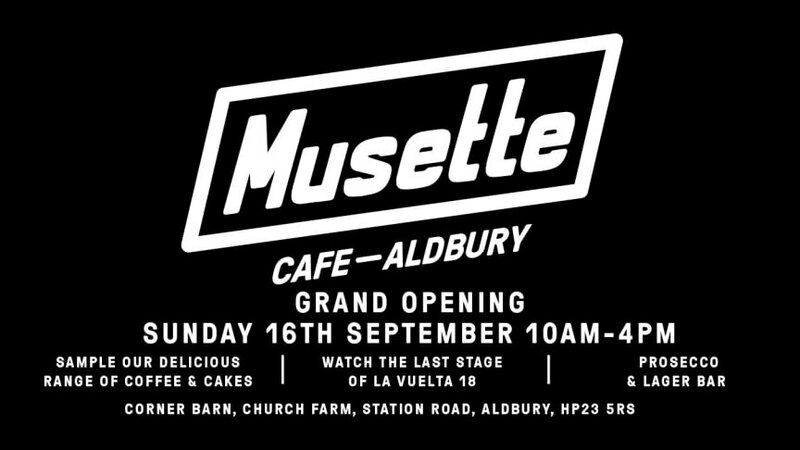 The event HQ is Musette Café in Aldbury, Herts. 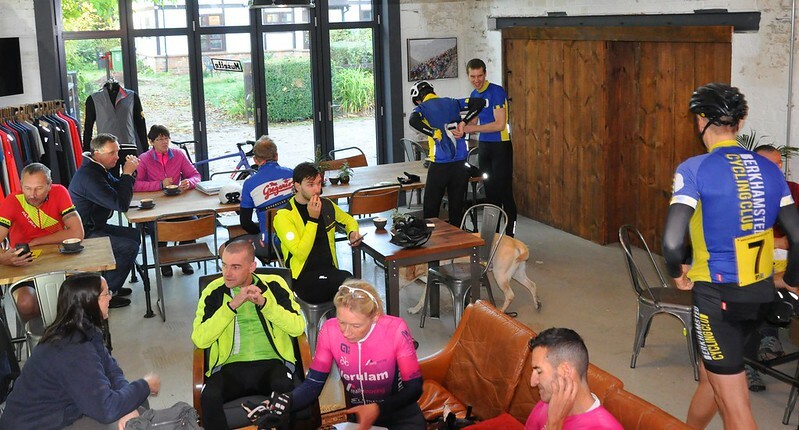 A recent addition in the village of Aldbury Musette has quickly become a destination for cyclists and walkers due to their fantastic coffee, amazing cakes and frequent events. We’re grateful for their support. At the end of the event there’ll be a free buffet and bottomless tea. Musette will be open as usual selling their excellent coffee and cakes. We’re pleased that Thames Valley Air Ambulance is our charity partner for this event. Recently a member of our club had an accident while out on a ride, TVAA were on hand to take him to hospital and he’s now on the road to recovery, we and many other people who’ve been helped by TVAA in their hour of need are hugely grateful for the service the TVAA provides. The TVAA receives no funding from the NHS therefore we’re proud to announce that all profits from this event with be donated to the TVAA. More information about the TVAA can be found here. The event will not be signed, you can download directions from the entry page, paper route maps will be available on the day. There will be no support on the road therefore riders should ensure that their bike is in good working order and carry sufficient spares and supplies as necessary. Third party insurance is provided by British Cycling as part of the cost of entry. Riders are reminded that they ride at their own risk. All participating riders are required to wear helmets. Riders should obey the rules of the road and ride with due consideration for other road users. Any riders observed not doing so will be ejected from the event. Parking is available at the event HQ but is limited. 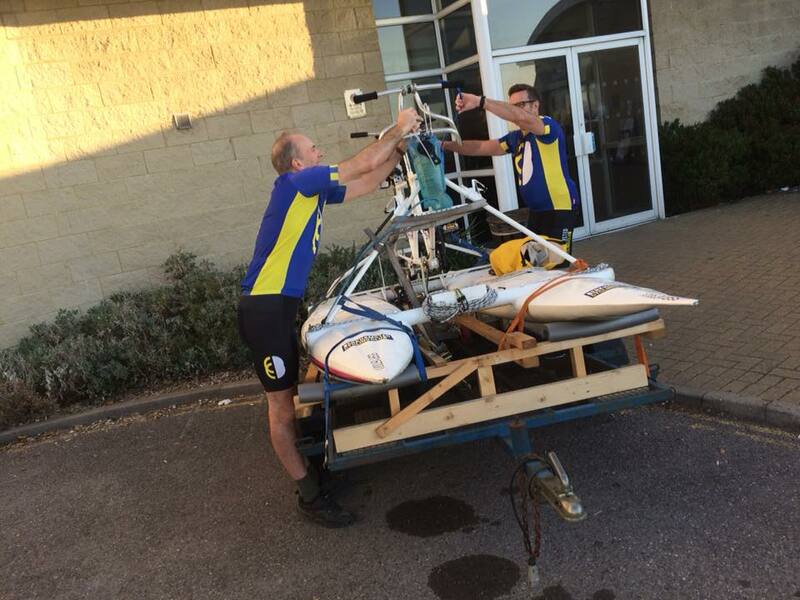 If you’re unable to park at the HQ you can park of at Tring Station c.1km from the event HQ, charges may apply. Please be considerate of residents who live close to the event HQ when arriving in the morning. If you have any questions about the event please click here to email the Club Secretary. 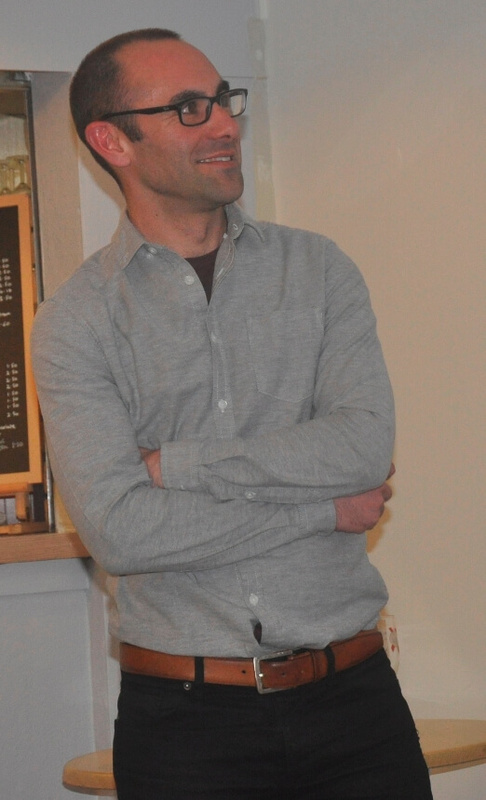 The club were proud to host a talk by Guinness World Record holder Leigh Timmis. 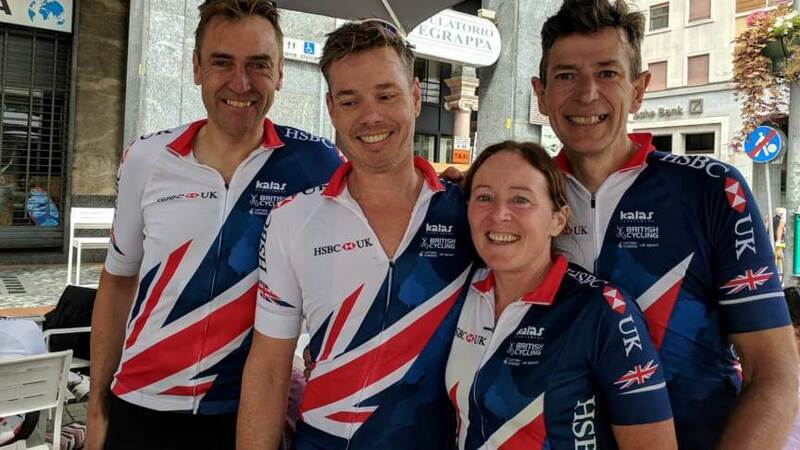 Leigh has recently broken the Guinness World record for the fastest cycle across Europe by an astonishing eight days. 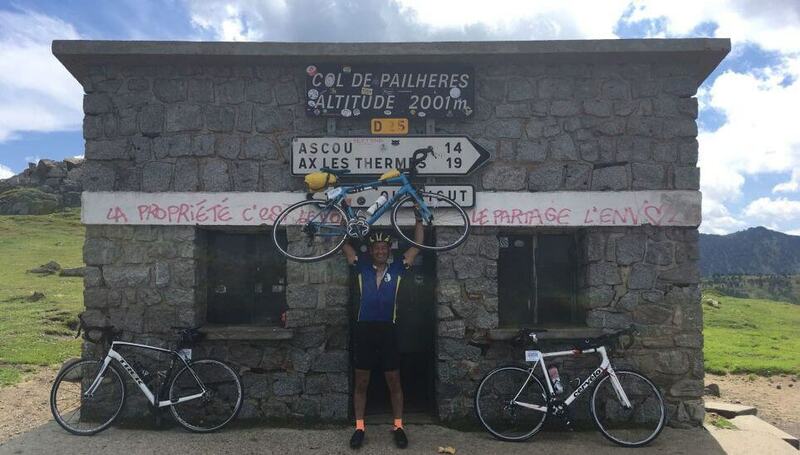 Leigh, who had previously spent seven years on a mammoth 44,000-mile cycle across the globe, left the most western tip of Europe – Cabo da Roca in Portugal – on 10th September 2018, intent on breaking the existing record of 24 days. On 5th October he arrived at the most Eastern tip in Ufa, Russia, close to the border of Kazakhstan, having completed the 3,956-mile (6330km) ride in an extraordinary 16 days, 10 hours and 45 minutes. 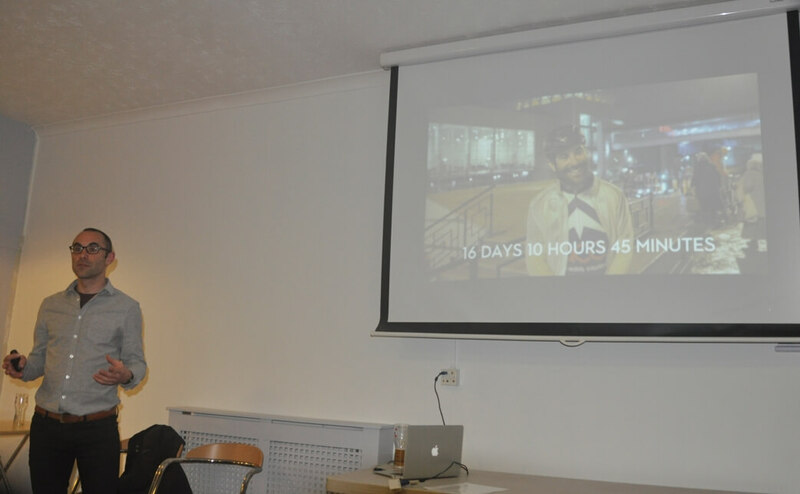 Leigh’s talk was engaging and inspirational sharing stories of overcoming adversary along with consuming 15,000 calories a day during the ride. A brilliant evening, and thanks to Heidi and the Committee for organising. Click here for more information on Leigh. 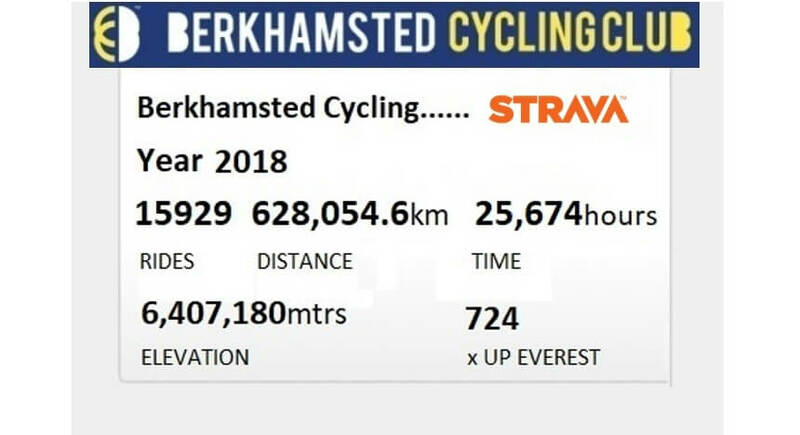 The club had a fantastic 2018 with riders putting in the km’s all over the world. If you would like to join in with us click here to visit our membership page. These are a selection of photos from the year and more can be found on our photos page. 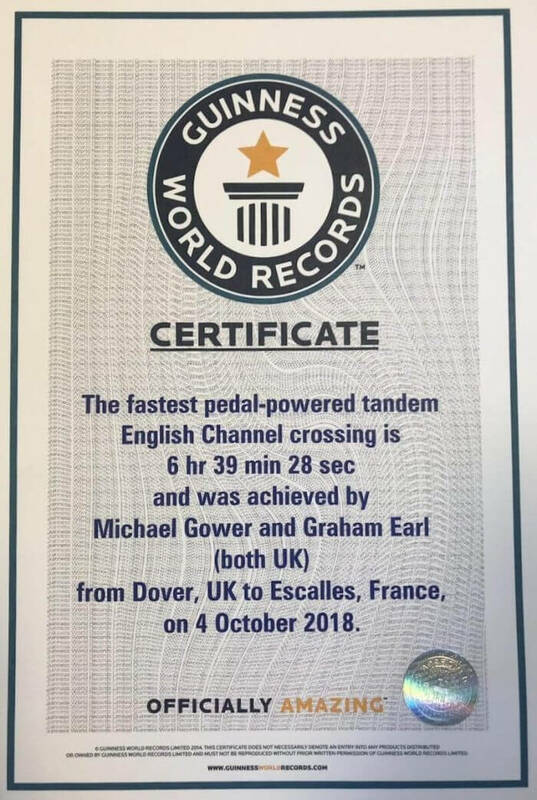 BCC Fastest Pedal-Powered Channel Crossing Thursday 4th October 2018. They have broken the record with 6hrs 39mins confirmed by Guinness World Records. The French beaches and finished! 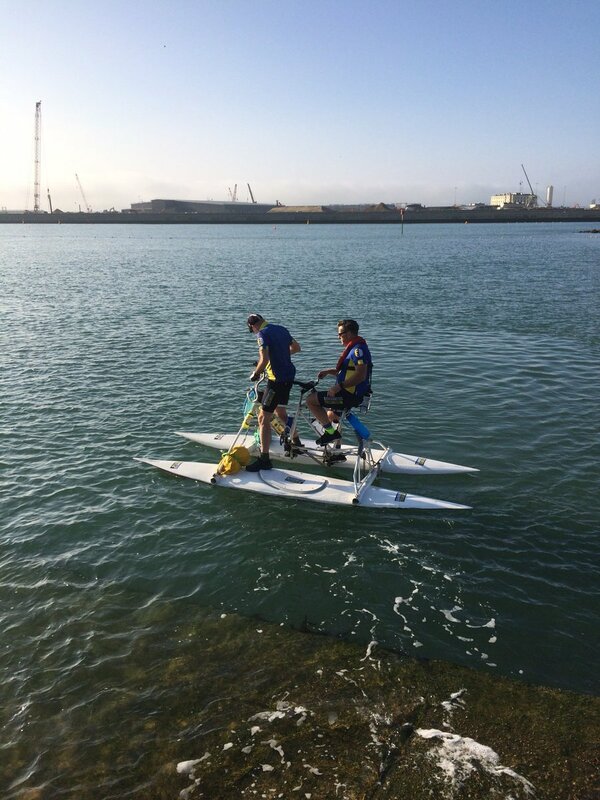 The attempt is to break the existing Guinness Book of World Records “Fastest Pedal-Powered Channel Crossing” which was set on 21st May 2002 by Paul Tucker at 7 Hours 6 minutes. 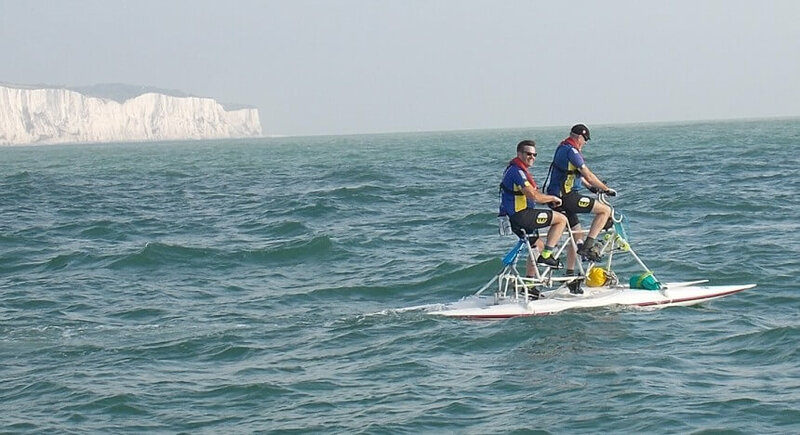 This attempt was made using the purpose-built, tandem pedal-powered catamaran “Dominic” ridden by Michael Gower and Graham Earl, two members of Berkhamsted Cycling Club. 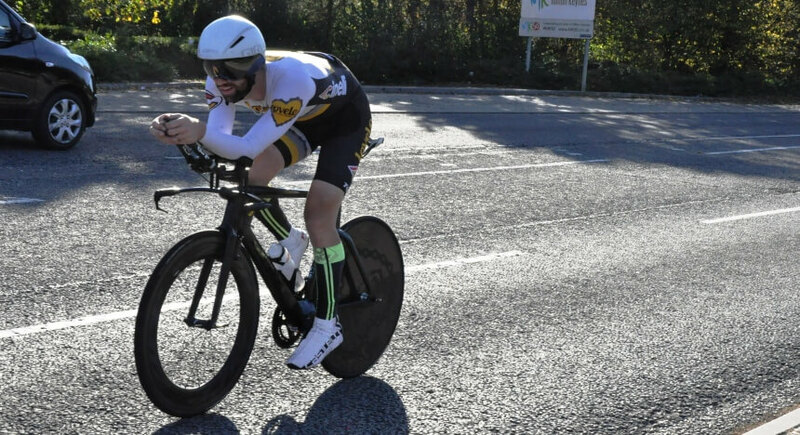 Having done a few duathlons, triathlons and did I mention an Ironman in the past, I thought I’d encourage a few of the purely cycle related athletes of the club to join me in an end of season multi-sport blow out at Hillingdon! It was a short duathlon, 2 mile run, 10 mile ride finished by a 1 mile run. 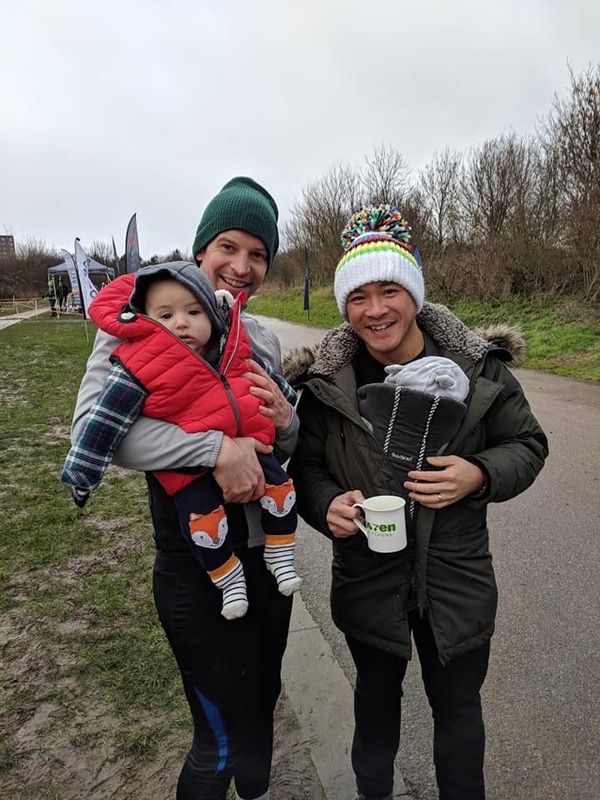 Mr Wong was the only one that stepped up, having already told me he ran the Manchester marathon in the past, (that in fact wasn’t classed as a marathon as it was 200m short, still a sore point). Other members I asked rolled their eyes at the running aspect, even though the distances were miniscule! It was wet, windy and early come race morning. 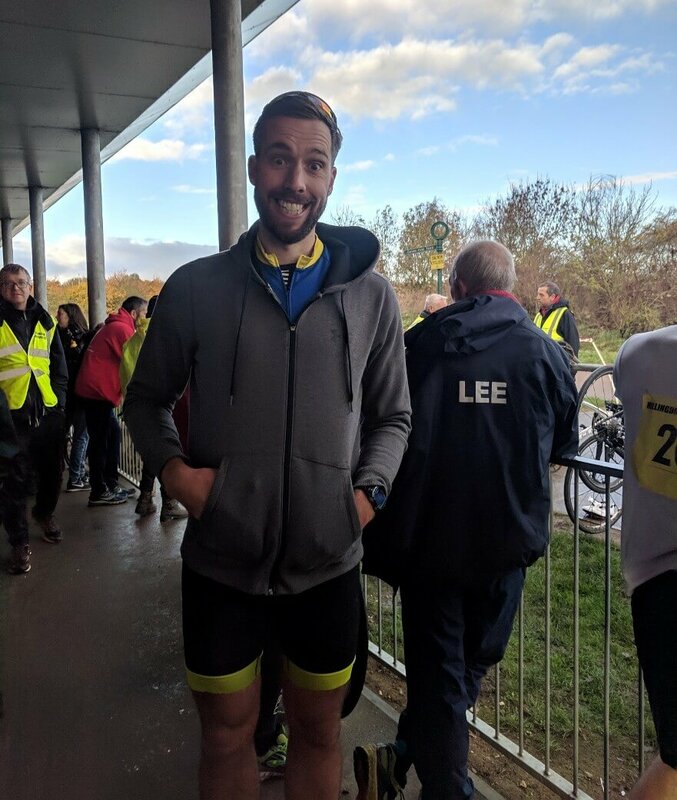 Tommy, despite having got lost on the way to the start, spilling a whole mug of coffee in the clubhouse, missing the race briefing, was fully prepared to lose his duathlon virginity. He rocked up with his ex-pro bike and was immediately seen as a threat! We lined up at the start line for the start of the event, Tommy and I found ourselves stood right at the front. We looked around and we were surrounded by what can only be described as whippet-looking racing snakes doing vigorous warm ups. We subtly drifted to the back, shivering, and waiting for the start gun to sound. The gun went off and so did the racing snakes, Tommy and I started our leisurely jog at the back but soon realised we were on to beat the 1 mile world record just trying to stay with the pack. 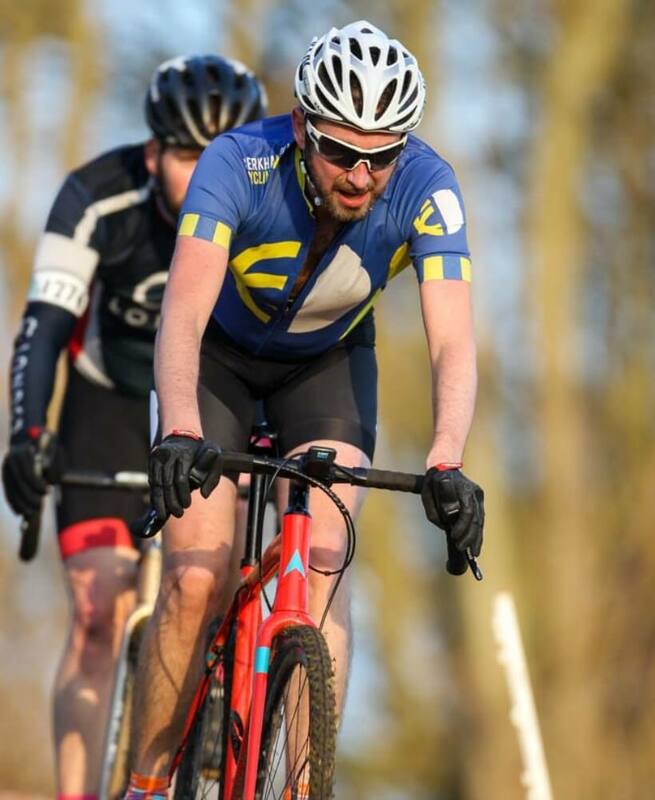 The course itself is a closed 1 mile cycle circuit, fairly flat and not too technical, so was a case of counting laps, 2 laps for the first run, 10 laps on the bike, finished with an all-out lap run finish. I made my way into T1 about 15 seconds ahead of Tommy. I stupidly had some crank/twist mechanism on my carbon cycle shoes so spent an age putting them on. Mr Wong slapped my rear as he entered transition, looking fresh and mischievous. We both headed out on our 10 lap cycle at the same time proudly sporting the BCC Jersey. Fortunately, I had my strap ons on my Canyon Aeroad (my aerobars). I tucked up in the aero position and powered my way through the brutal head wind whilst noticing Tommy fighting the wind behind me. He’s not used to being so exposed being the expert draft master he is. I opened up a half lap lead by the end of the ride. Starting the final 1 mile run was a strange experience. In my head and being “metricised” I didn’t see a mile as far, so started out full gas with lead like legs from the bike. When my HR soon went into the high 190’s I decided to reel it back in, conscious that the short distance sprinter Wong would relish a 1 mile lap. 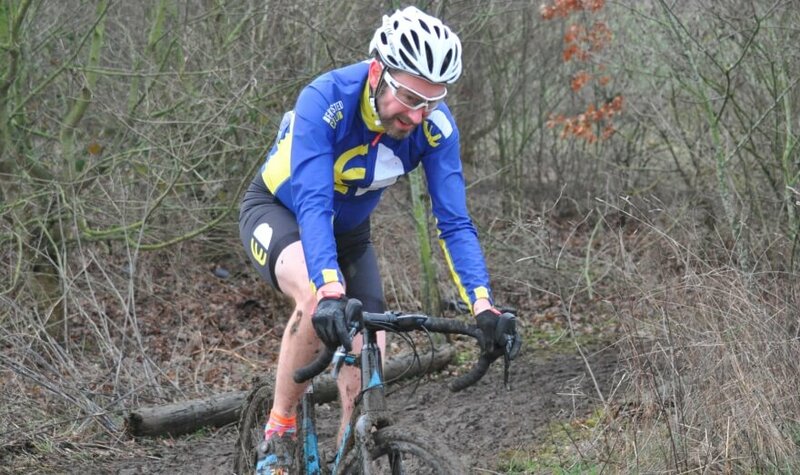 I told myself not to look back as I caught a flash of the other BCC jersey in my peripheral vision! The sun was now beating down as I crossed the finish line. I turned to noticed Tommy rounding the corner only a handful of seconds behind! What a performance for his first multi-sport event and such a huge smile! We both finished in the top half of the results table, which isn’t too bad seeing I’m 6ft 3in weighing 95kgs and run like a hippo. Tommy is the complete opposite, 5ft 3in weighing 30kgs looking like a graceful gazelle. 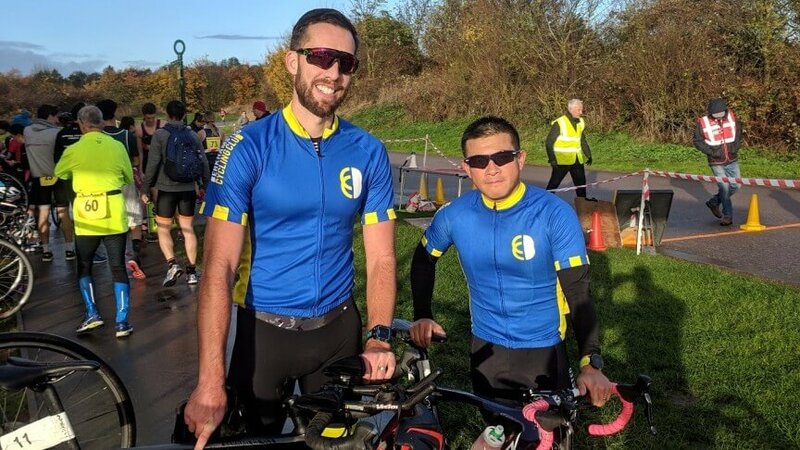 Tommy and I felt we needed to share the accomplishment on the club page to encourage multisport, we kindly asked the guy stood next to us to take the picture, but as we handed him the camera he got called up onto the podium to collect his first prize! Typically us newbies asked the race winner to take our pic! Ha. He kindly returned to us after spraying his champagne to take our snap. How embarrassing?! 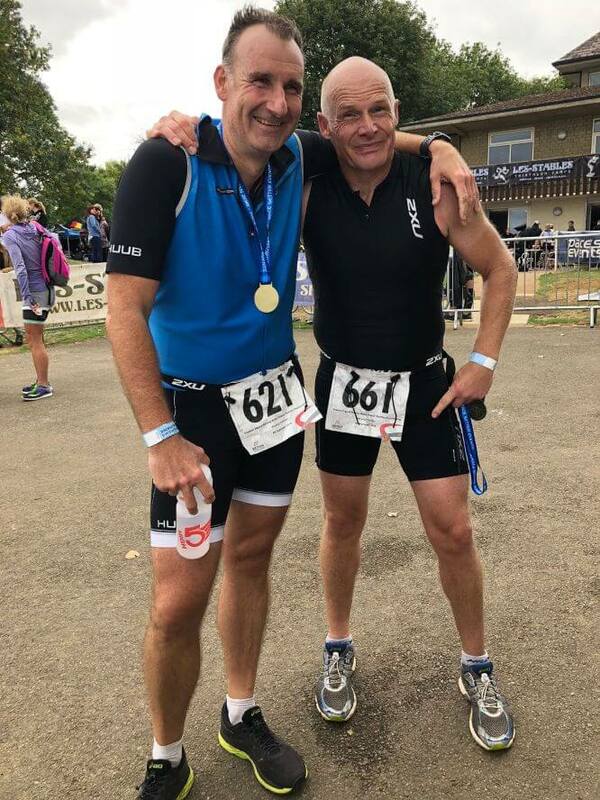 Just a couple of words from me to add to Lee’s excellent write up, I have been gradually reintroducing myself back into running, mainly in preparation for being a bit more time-poor next year, so the Hillingdon Duathlon seemed like the perfect event to dip my toe in, literally. Lee failed to tell me that drafting was not permitted until just before the start, which was a bit like telling Messi he can no longer kick the ball with his feet. 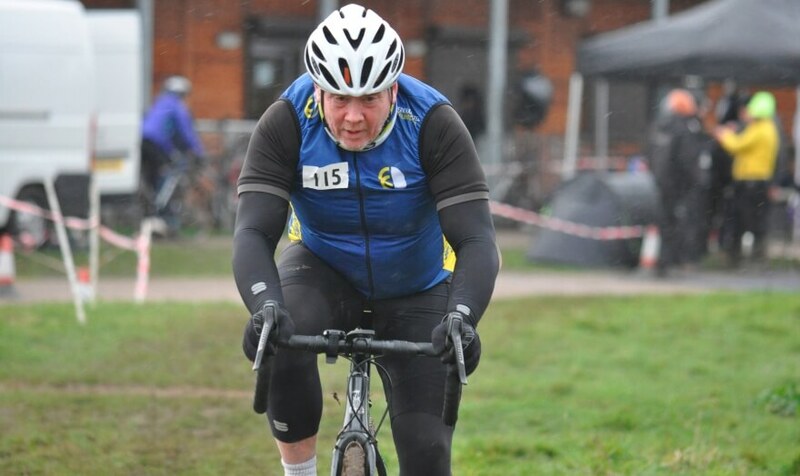 Despite this handicap, rain and the nasty headwind, I thoroughly enjoyed the well-organised event and keen to try some more multi-discipline events. I just need to borrow Janice’s armbands. Big thanks to Lee for talking me through it and cheering me on at the end, it was a fun morning out and the Maccies breakfast afterwards was well earned. 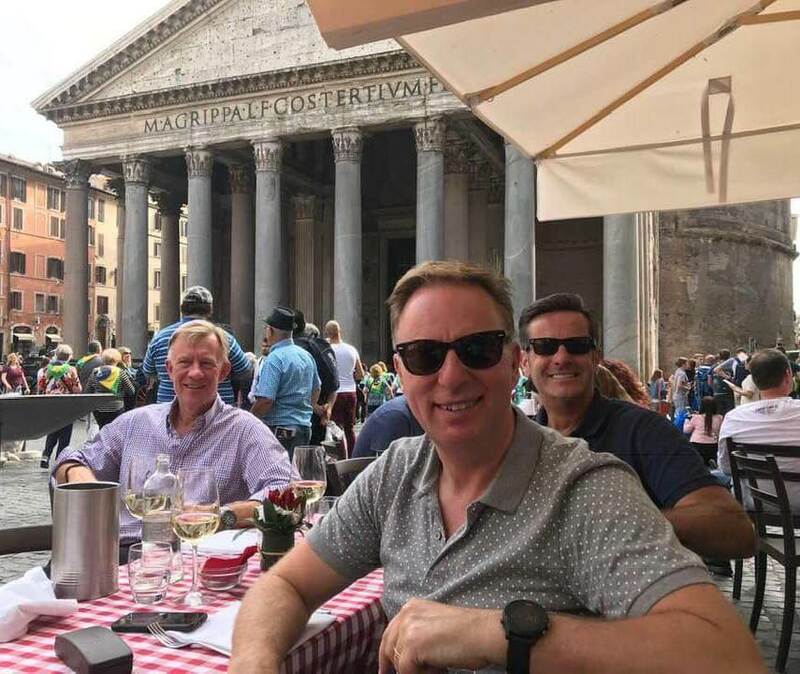 Club members were spread across the globe during October while many were nearer home making the most of late summer sunshine. 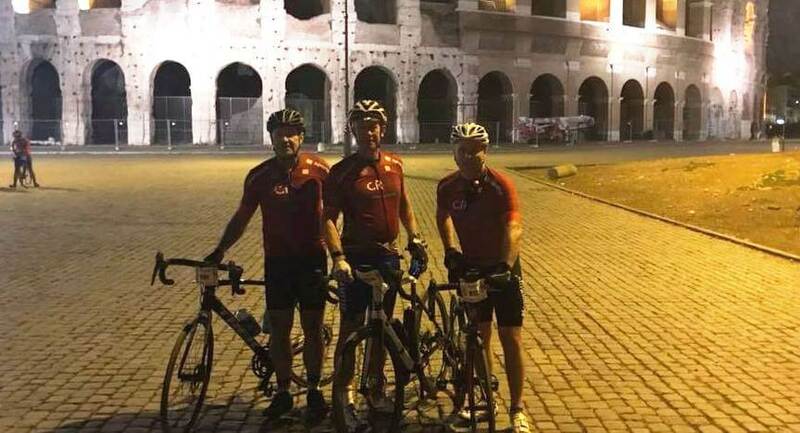 Michael, Mike and Paul were enjoying the samples of Italy taking part in the Roma GrandFondo. Of note is that all three would also feature in the clubs AGM. 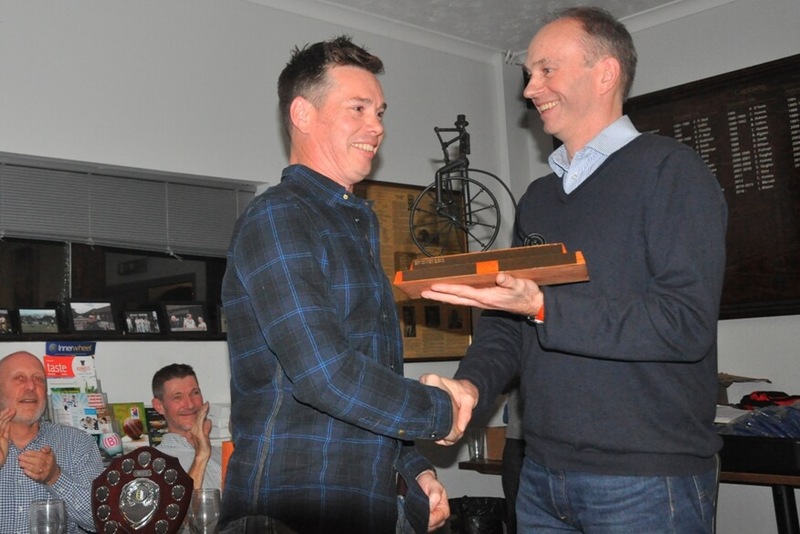 Michael stood down as Chairman, Mike took the Chairman’s position and Paul won the ‘Broken Spoke Award’. Trevor had also planned the Roma Classic Bike ride but a very unfortunate road accident kept him at home. Watch the website for updates as Trev will be featured in a Channel 4 Air Ambulance Rescue series planned for winter 2018/19. 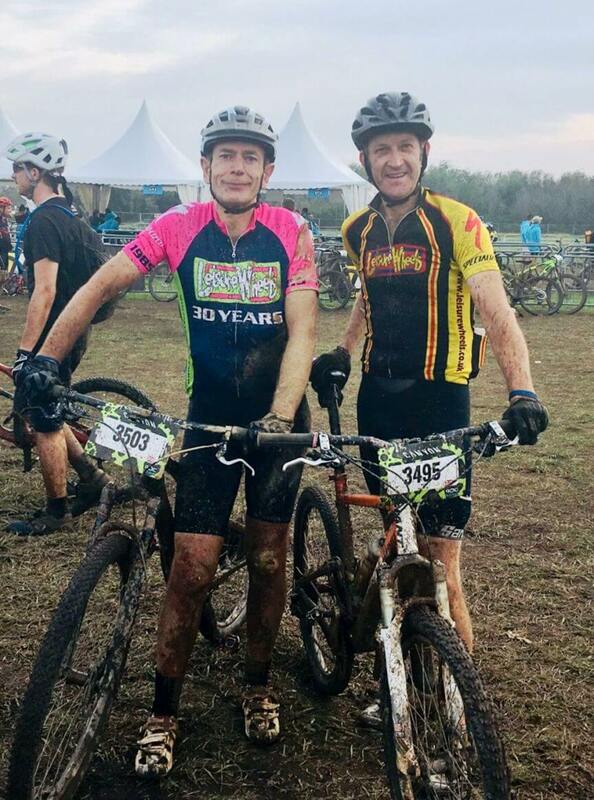 Miles and Rob competed in the Roc d’Azur 2018 Marathon in Fréjus, Southern France. 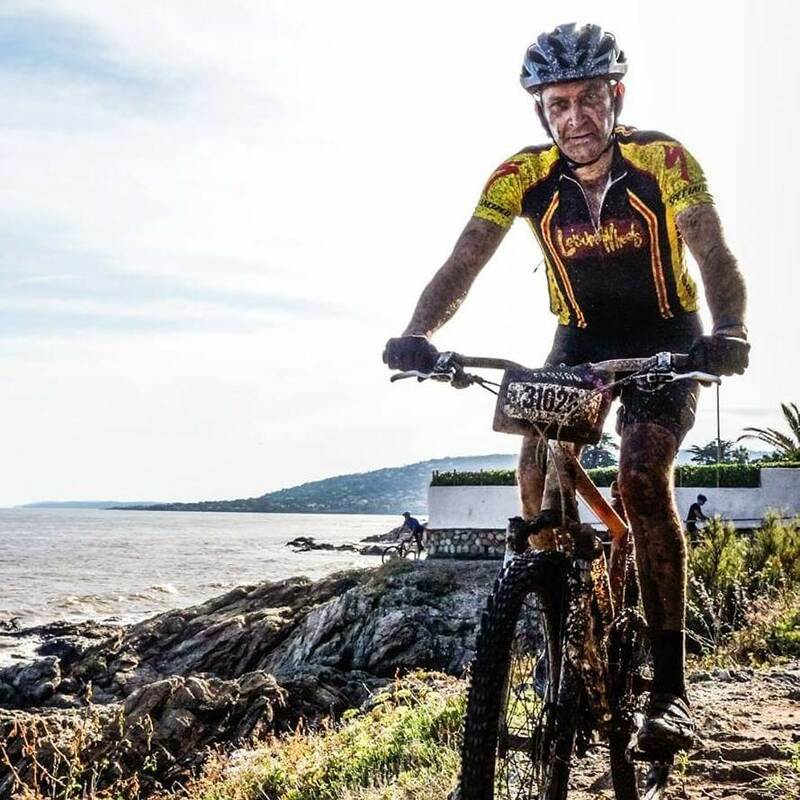 A grueling 89 km mountain bike race over very rough terrain with 24,390 meters elevation. 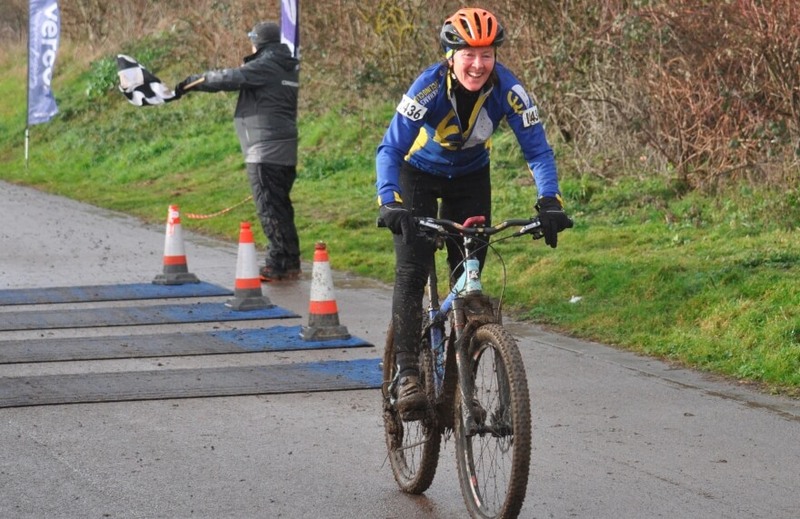 The club has an active MTB group and if you would like to find out more click here to send an email to the secretary. As 2018 draws towards its latter months it’s a good time to reflect on what has been achieved by our club’s members. Summer is hanging on, just, much later than it has any right to, but even though the days are shorter, the temperatures are still way up above the seasonal norm, meaning it’s still possible to get out and enjoy fair weather riding. 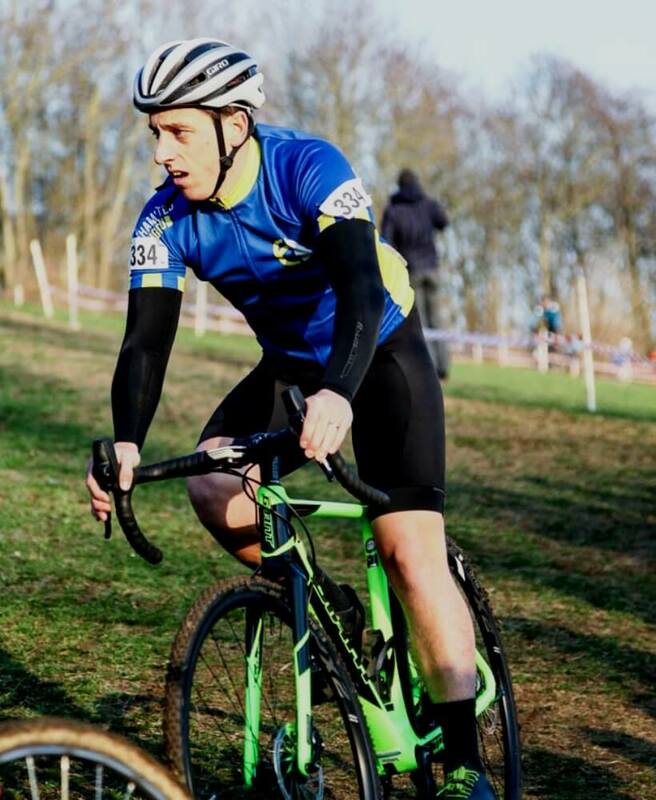 Having said that, the summer racing series have closed and we’re heading into the winter crit and cyclo cross season. This season has seen more BCC members taking part in competitive events than ever before, with many outstanding results being achieved. 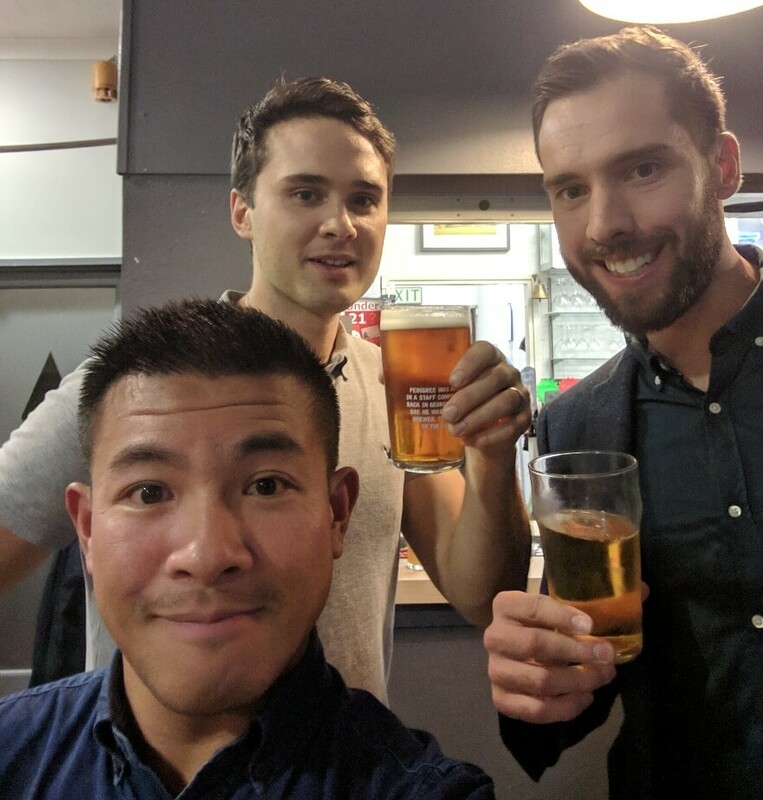 Several members have dipped their toes in the waters of competitive cycling for the first time, while others have enjoyed their first taste of the (metaphorical) Champagne. 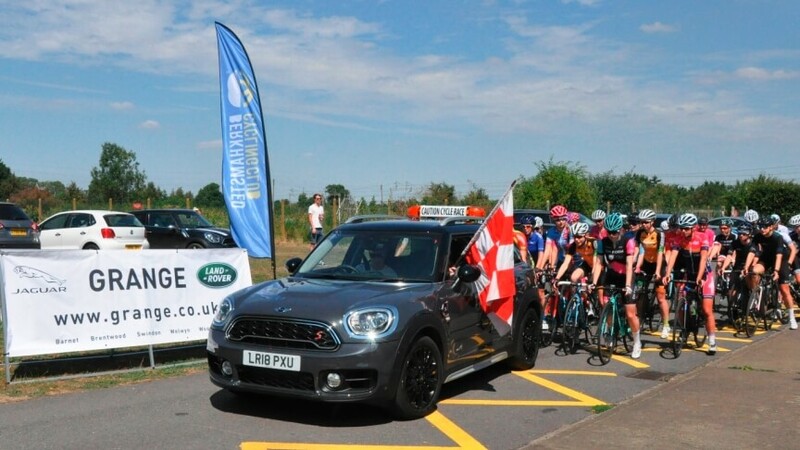 The club has hosted four main competitive events, across different disciplines, and entered no fewer than three teams in the 9-up team time trial at Silverstone, including our first ever nine-person women’s team. Both of the men’s teams improved on their previous times, while the women set an initial time as a benchmark to build on in the future. 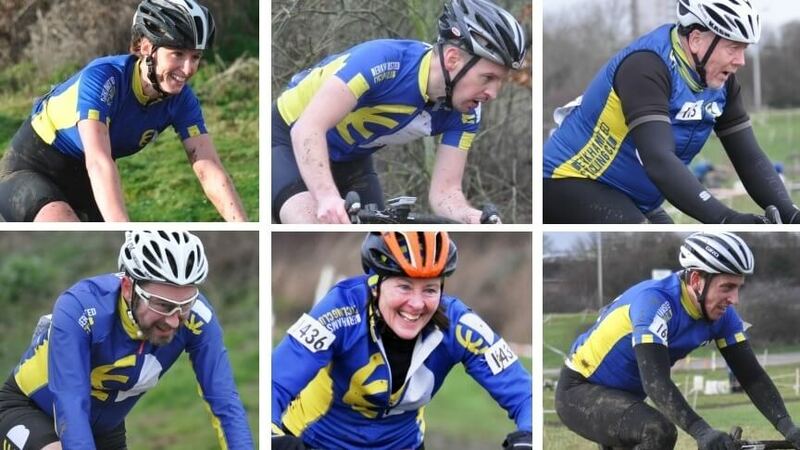 Aside from these club events, many members have raced on their own account, flying the BCC colours in crits, road races, triathlons, individual and team time trials and cyclo cross. 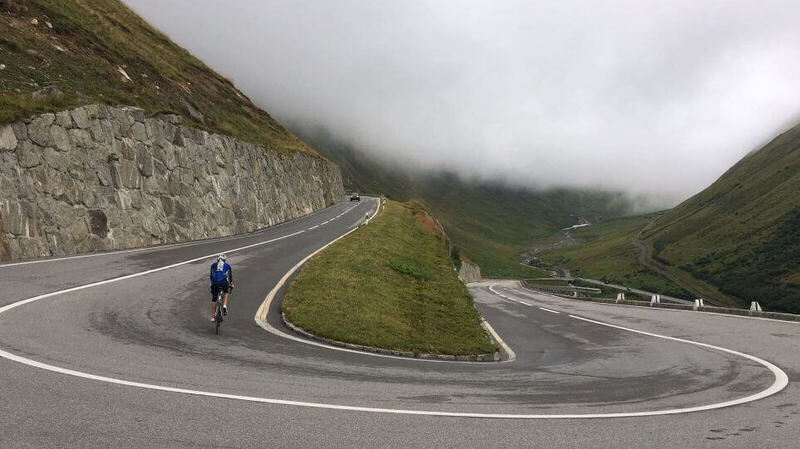 It seems that hardly a week goes by without large numbers of our club riders completing sportives, with mass participation in the Prudential Ride London 100, a good representation in the Liege-Bastogne-Liege, and one or two tackling the grueling Dragon Ride, Fred Whitton Challenge and the Maratona dles Dolomites, to name just a few. 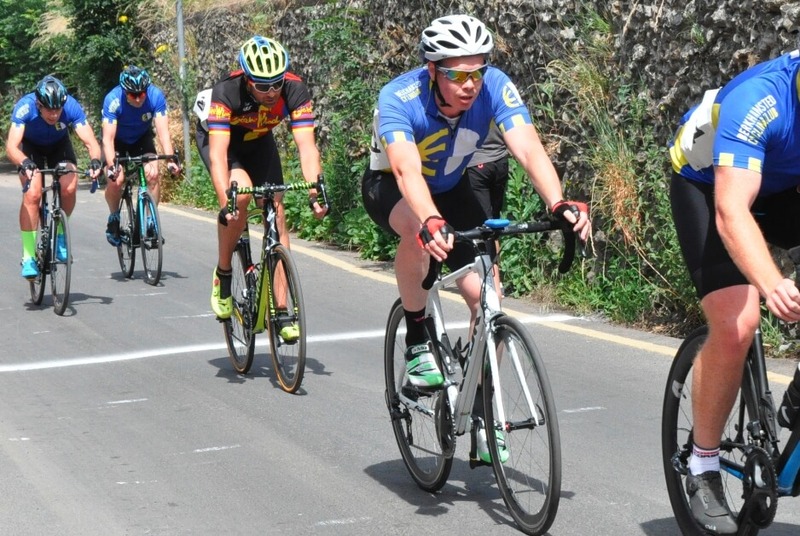 With a fine spread of club members taking on the Tour of Cambridgeshire – a qualifying round for the amateur world championships – five of their number qualified to represent Great Britain in Italy. We even have our own Ironman, and several who took on and conquered half ironman competitions. 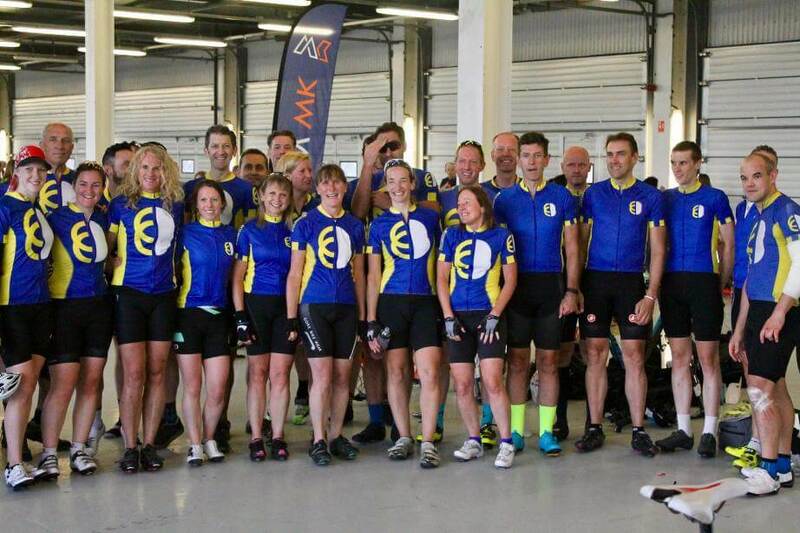 Apart from these organised events we’ve had the greatest ever number of our membership heading off to tackle tough rides in all manner of mountain ranges around the world. We have also claimed a new world record. Everyone, it seems, is getting more ambitious and pushing themselves harder and further than ever before. Pretty impressive for a club that’s only four years old. 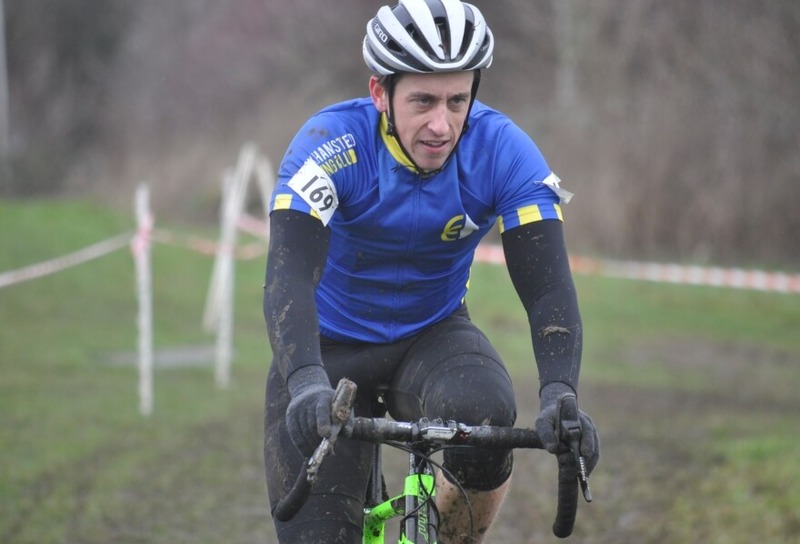 The year started with the Harp Hilly 100, which BCC won for the fourth year in succession. 51 members braved the chills and hills to bring home the much-coveted shield again, much to the chagrin of other local clubs. 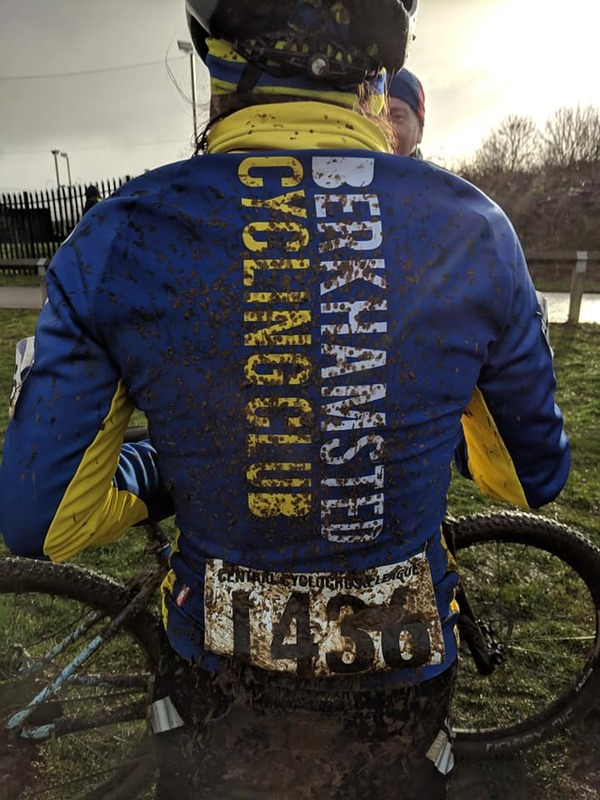 By April the weather hadn’t improved much, but nonetheless a good crop of club members took part in the Berkhamsted Triathlon. 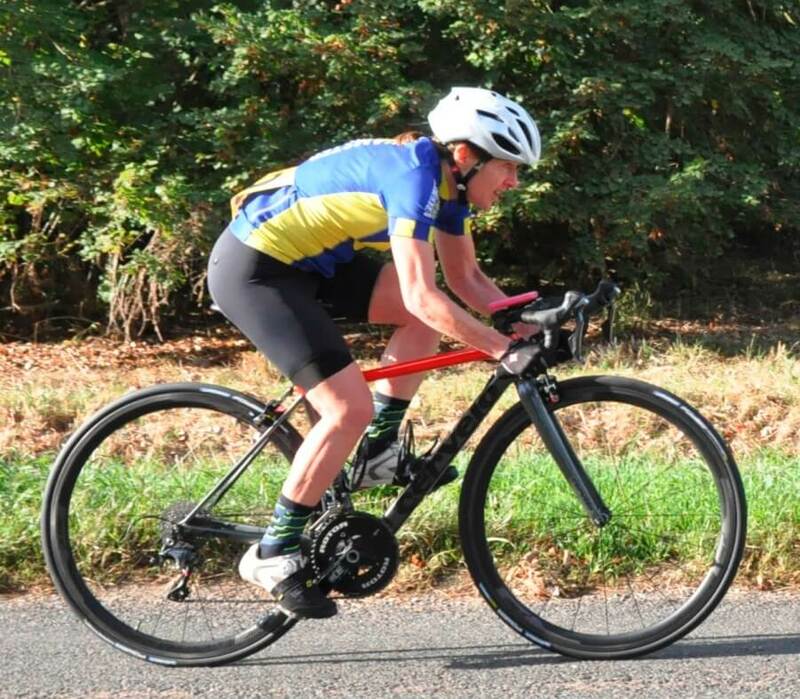 We had individual members competing as solo entrants and we also fielded several teams of three, with overall victory going to BCC’s team comprising Emily Hartwell (swim), Matt Buckle (bike) and Rob Chambers(run). The fastest cycle leg of the day went to our own Simon Pearce, who just pipped Matt Buckle’s time. 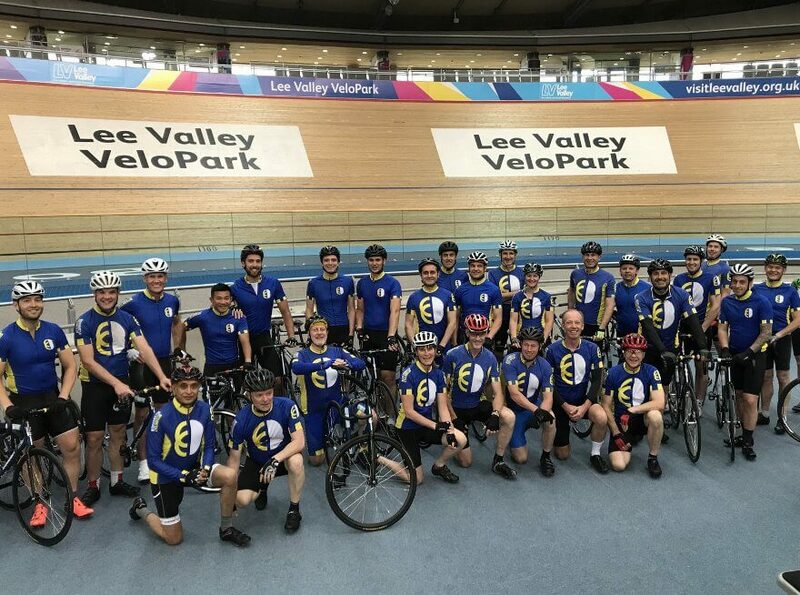 May saw us visit the London Olympic velodrome, as 32 of us descended on the track to take over the venue, giving a fair few their first experience on the banked wooden boards. This was just a fun event, but more than one came away pledging to become accredited on the tracks and take up the sport. 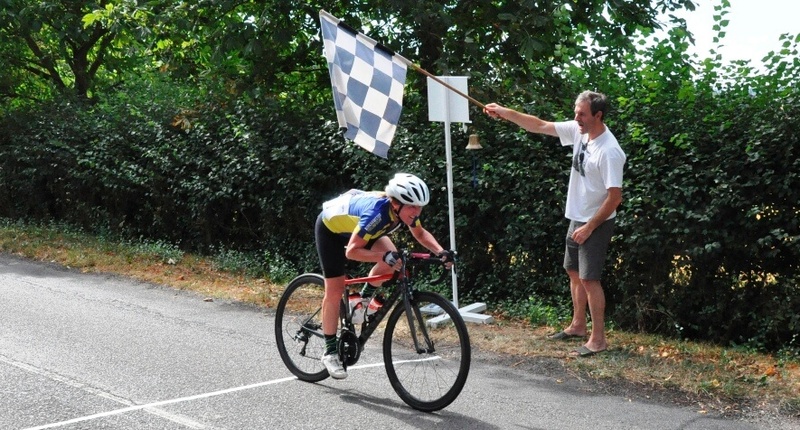 June witnessed the Berkhamsted Castle Revolutions Festival, a day of crit racing on closed roads, which provided spectacular racing throughout, and a win for one of our members in the hotly-contested men’s novice race. In fact our club members dominated the results, with two podiums, five of the top six places, and seven of the top ten going to BCC. 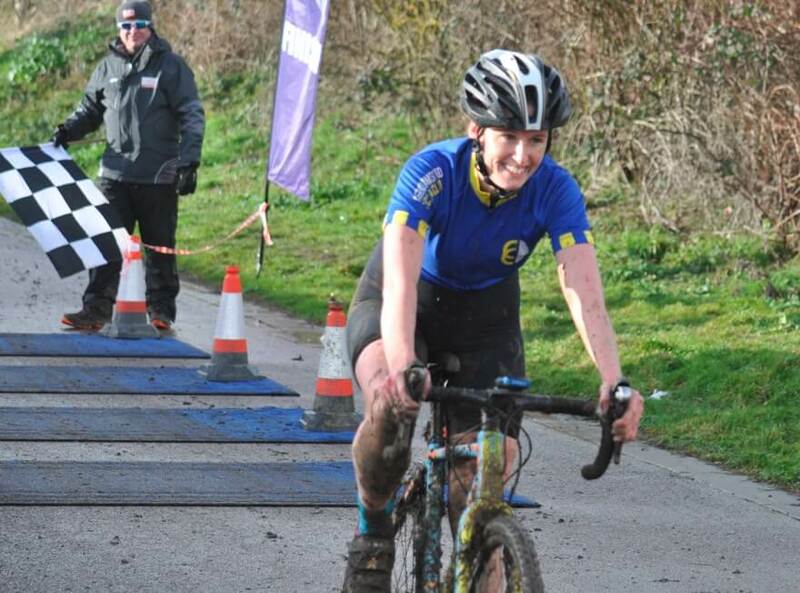 2nd place in the women’s novice race also went to a BCC club member. 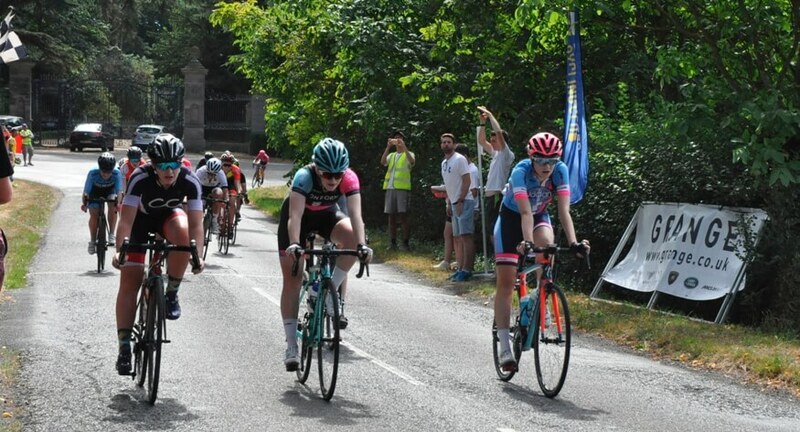 Into August and the BCC Road Race was run on a loop around Mentmore. An expansion from last year came in the shape of a women’s race in addition to the men’s. 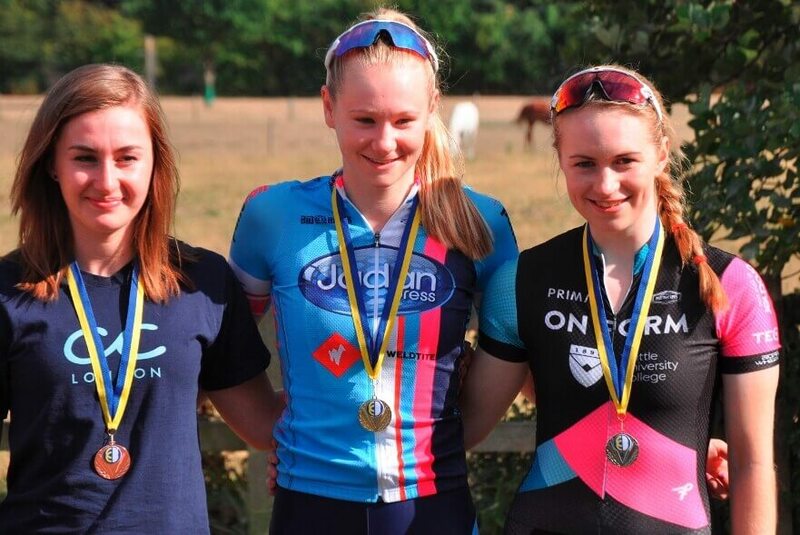 Across the two competitions we fielded an impressive seven riders, and came away with a win in the women’s Cat 4. In September our 10 mile open time trial was revived on the Mentmore Loop, with a good turnout of 23 BCC members on the starting line. 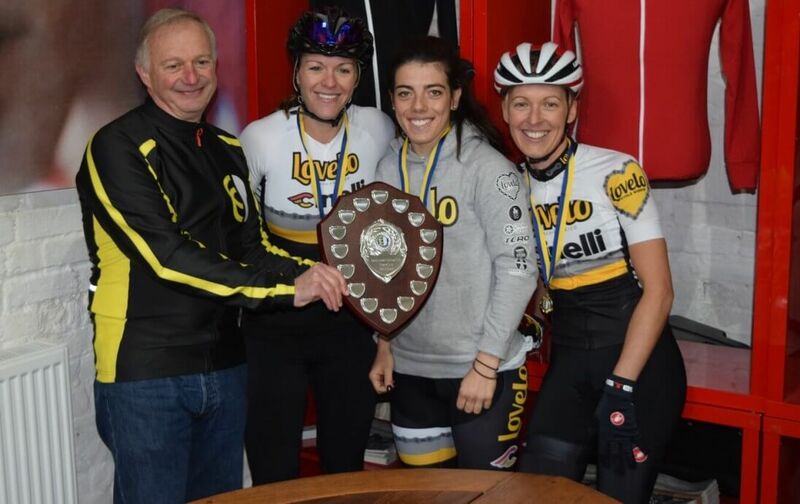 Our ladies were narrowly beaten to the Team Shield by Lovelo Cinelli Race Team, but we had a win in the “Athlete” class for standard road bikes. The men’s team went one better and brought home the Team Shield and took an individual bronze medal, while the “Athlete” medal was won by a BCC member, albeit entered under the Lovelo banner. 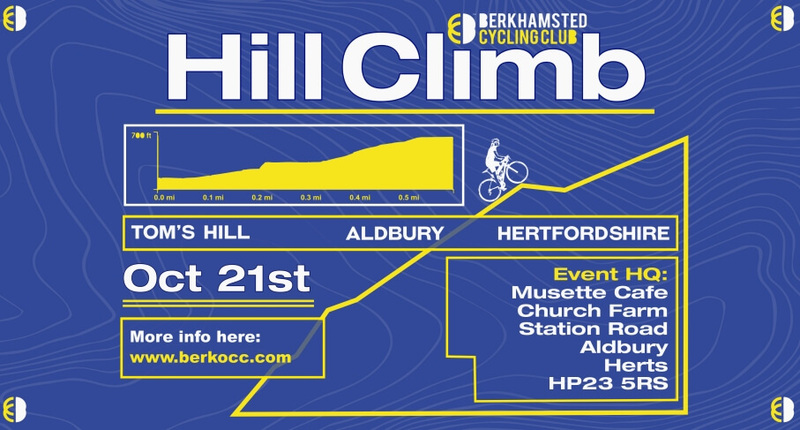 Which brings us to our last competitive event of the season – our club hill climb, run up Tom’s Hill in Aldbury in late October. 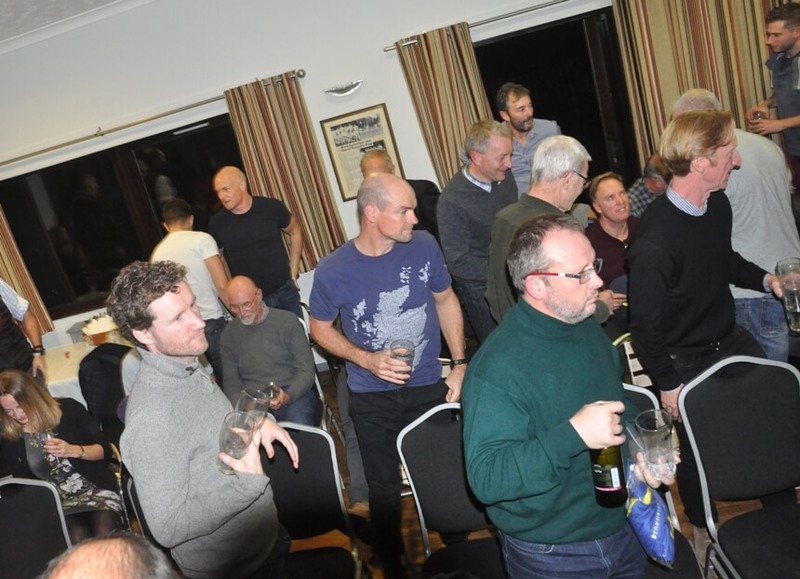 A good showing of entrants from several local clubs, and one or two who had come from as far afield as Dulwich came to the start line, and was interspersed with a few of our own lightweight uphill flying machines. Although we didn’t win any prizes today, BCC put on an excellent showing and were roundly applauded and thanked by all those who took part, whose generous appreciation and acknowledgement made it all seem worthwhile. So, all in all a very satisfactory season for BCC. 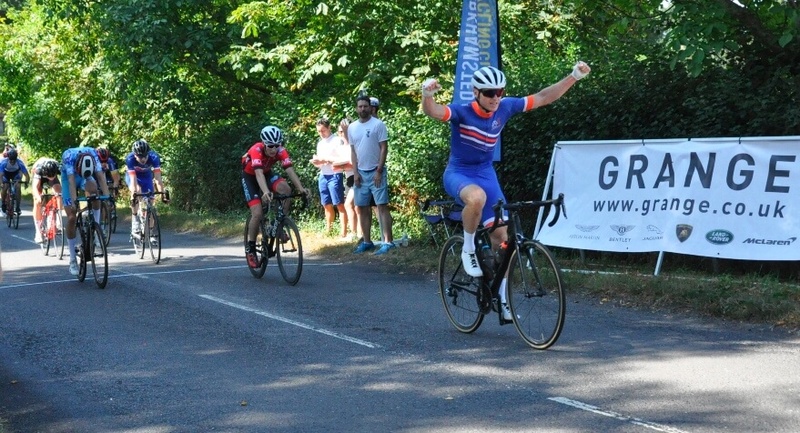 Matt Buckle, for his win in a Cat 3 crit race at Hillingdon. He would have scored a second win, but elected to take the short cut to hospital instead. 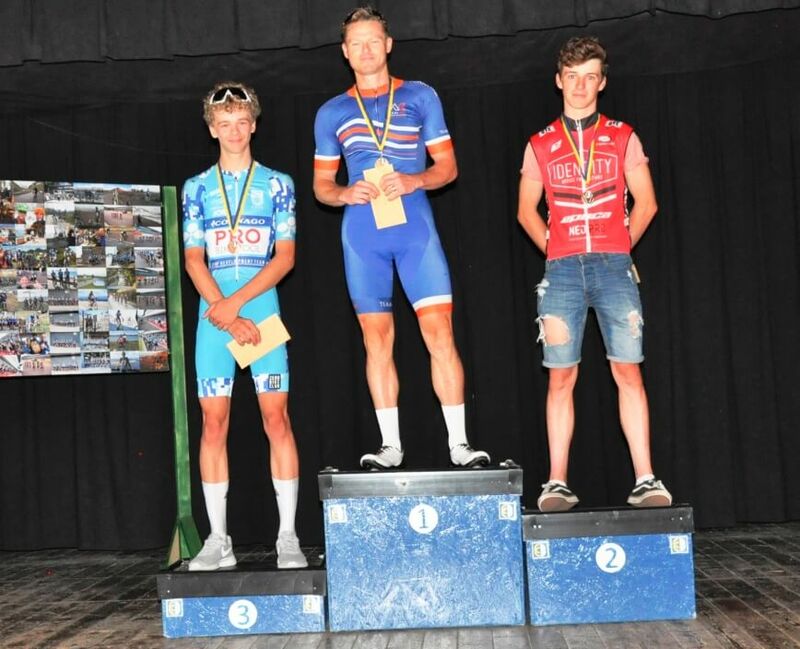 James Taylor, who within two weekends went from a Cat 4 racer with zero points to a Cat 3, with a fantastic race in which he just missed the win. 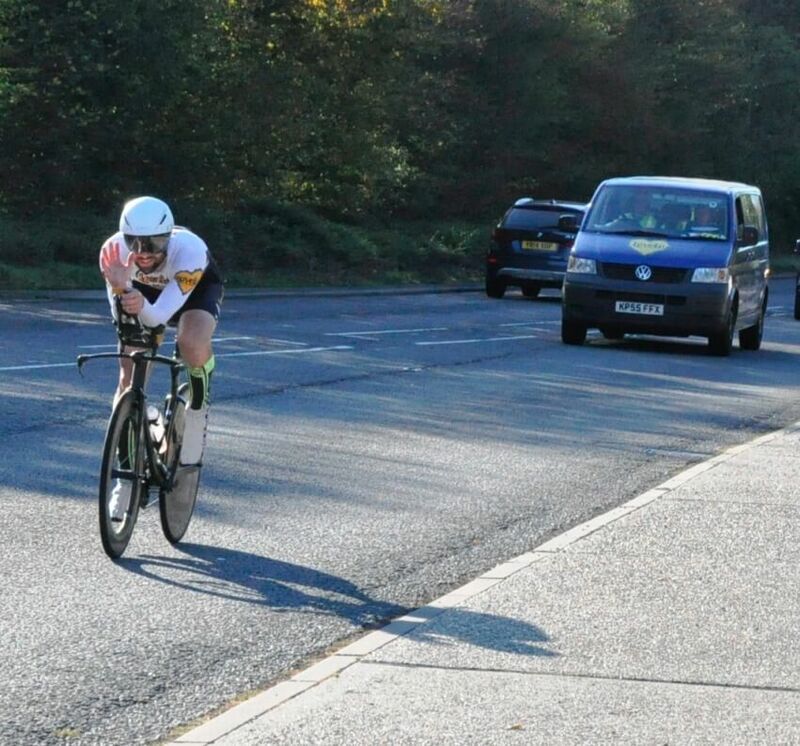 He also put in some great time trial performances. Ben Nixon, for winning in his first ever race, and going on to represent Great Britain in the UCI Gran Fondo World Championships in Italy. Simon Pearce, for continually putting in outstanding performances every time he rides. 3rd in his age group (58th overall) in Ride London and 12th overall on Velothon Wales. Another Great Britain representative at the world championships. Heather Taylor, for her 2nd in the women’s novice race at BCRF and her two triathlon wins. Janice Bell, winner of the women’s Cat 4 in our road race and the “Athlete” class in our time trial. 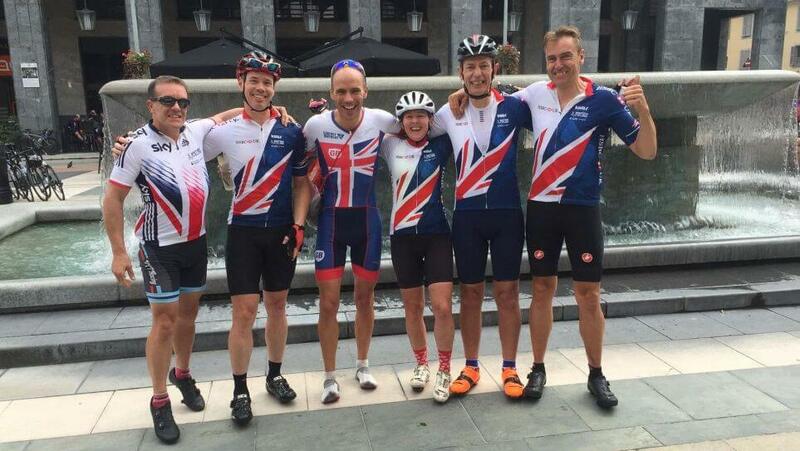 Also, Janice qualified for, and represented Great Britain in the world championship Gran Fondo. Lee Morgan, for completing an ironman competition. The above is just a small selection. Across the board no fewer than 67 of our members have competed in races of one form or another this season. Take a bow – you deserve it. 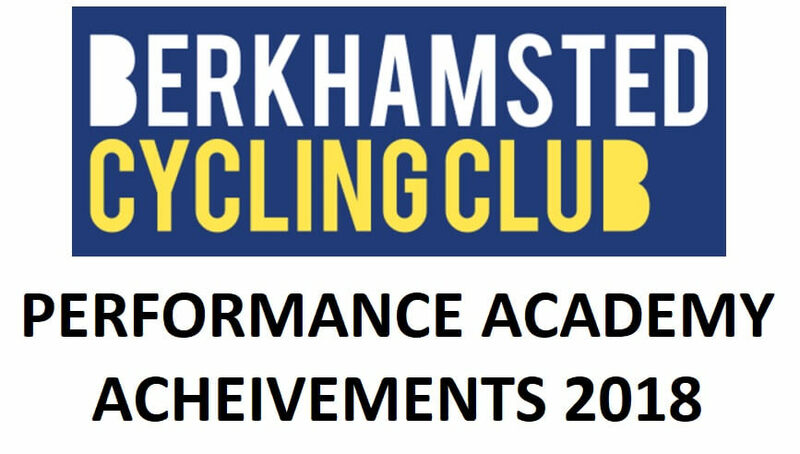 For photos, reviews and results click here to head over to our Performance Academy News section. For information on races that the Academy plans to enter click here. 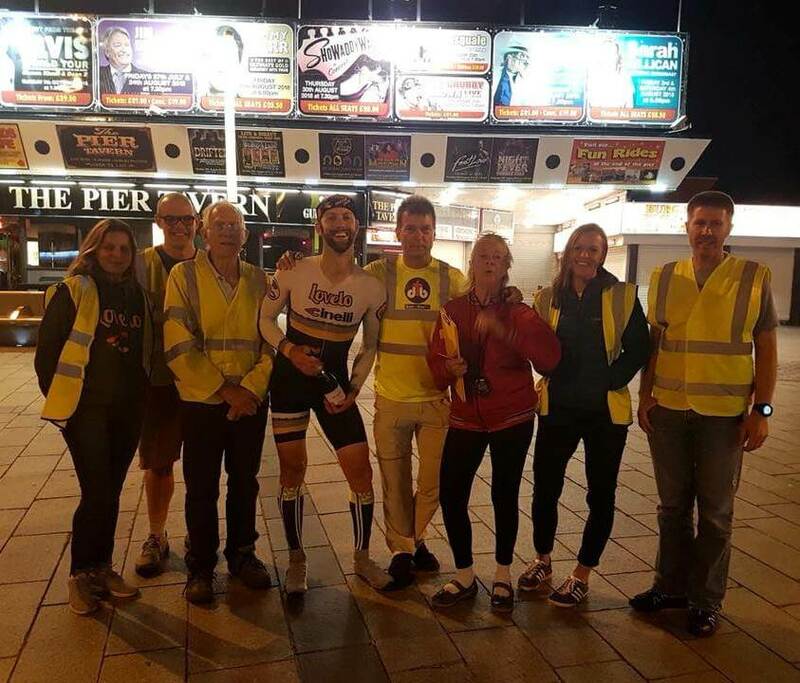 Local cyclist and founding club member Nick Clarke has broken the #Sidetoside cycling record from Pembroke, Wales to Great Yarmouth, Norfolk on 4th October 2018 in a time of 15hrs 25mins. This beats the previous record by 1hr 16mins. 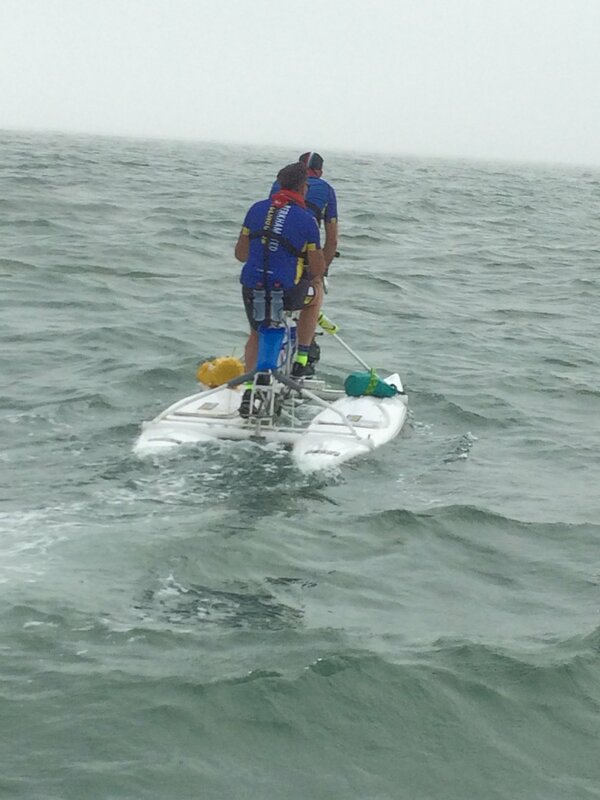 Nick covered 351 miles at an amazing average speed of over 23 mph. He got through almost 10,500 calories and is extremely grateful to the support crew as without them the attempt would never have gotten off the ground. 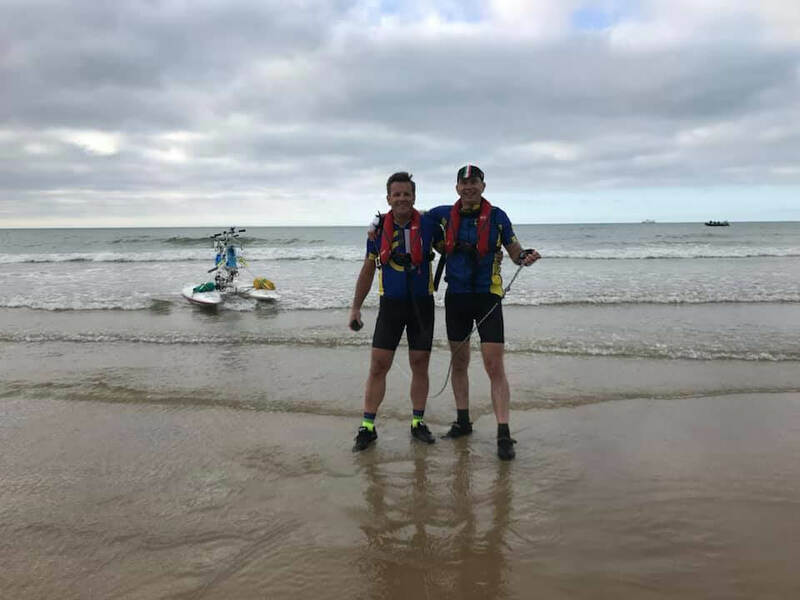 The club congratulates Nick on his incredible achievement and on the same day as BCC members Michael and Graham broke the Pedal Powered vessel English Channel Crossing. 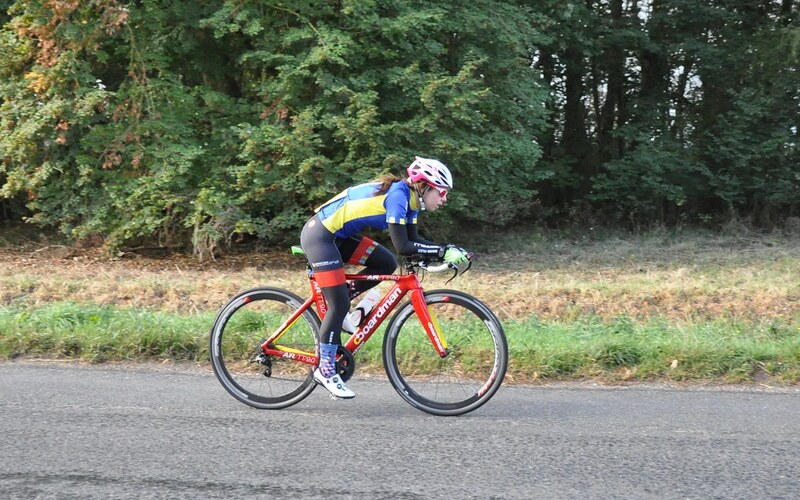 Sunday, 30th September saw BCC host its annual 10 mile open time trial on the Mentmore Loop. We were favoured by bright conditions, albeit chilly to begin with, and all competitors got round the course with no reported incidents. 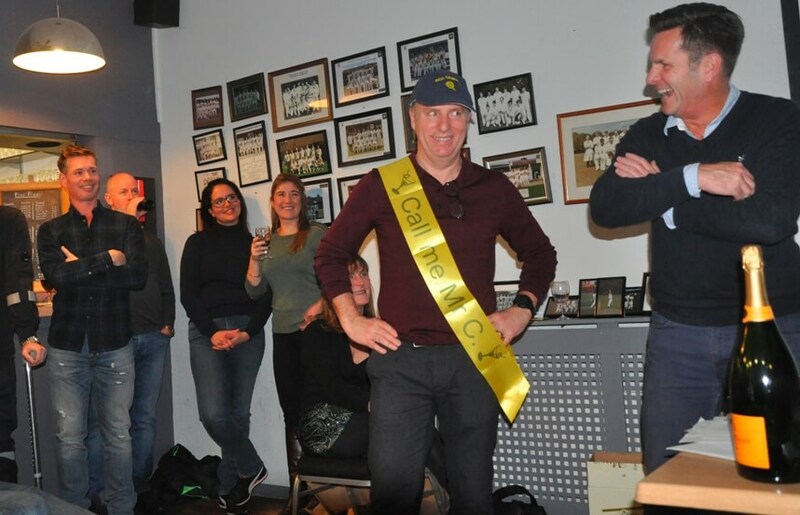 Awards were spread around local clubs and teams, with BCC bringing home a few of the medals, to the appreciation of the partisan crowd. Congratulations to the Lovelo ladies, who won the team shield, just ahead of BCC’s women. Our men won the corresponding shield for the gents, for the second year in succession. Well done all and many thanks to Graham the organiser along with all the volunteers. 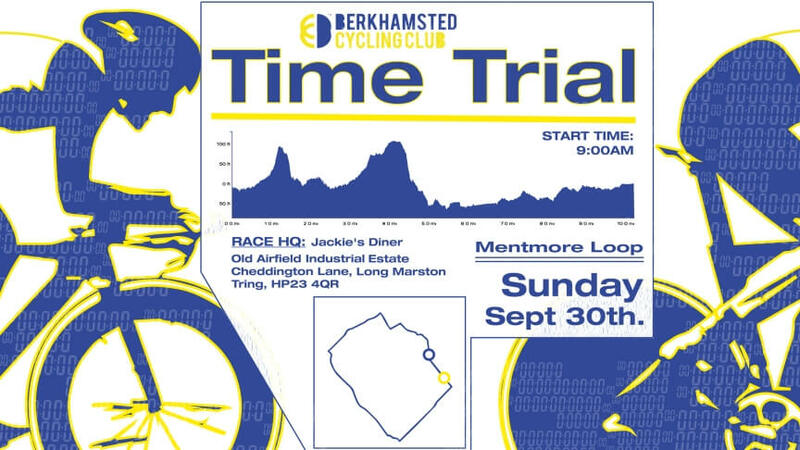 Click here for the results on Cycling Time Trials. Click on the image below for pictures of the day on Flickr. Free to download and share. 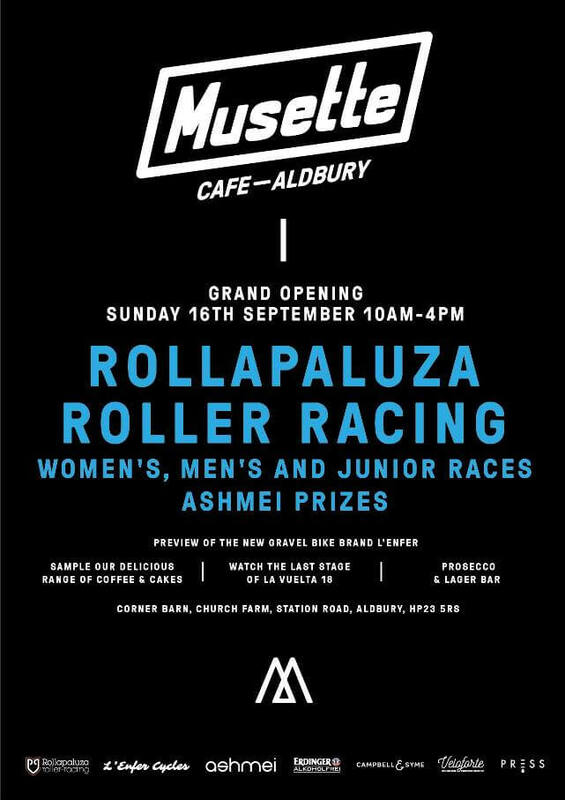 Our club secretary Simon is very excited to be opening the doors of Musette Cafe in Aldbury for the first time to everyone on Sunday 16th September. Come and sample their delicious range of cakes, have a go at Rollapaluza racing to win ashmei prizes, check out new gravel bike brand L’Enfer or just enjoy a nice cup of coffee whilst watching the last stage of Vuelta a España. Click here to follow Musette Aldbury on Facebook. 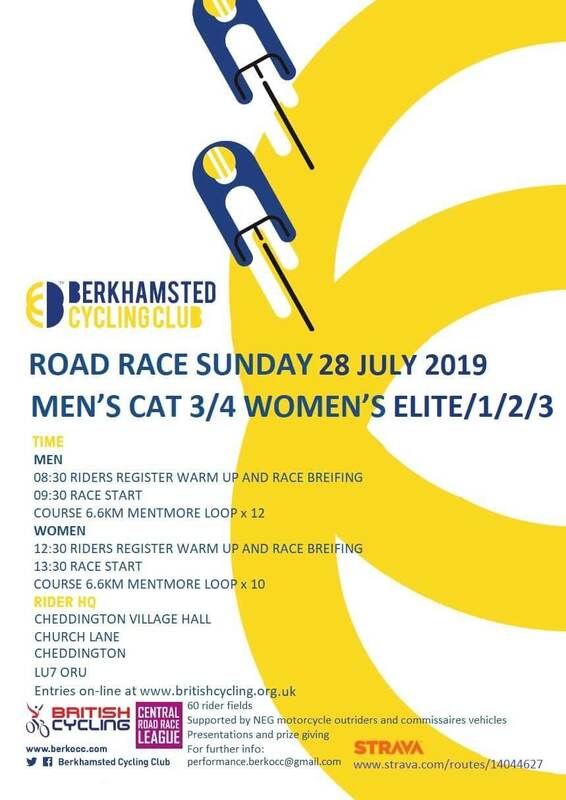 Sunday, 5th August saw Berkhamsted CC hosting its second road race. This year the event was expanded to include a women’s race as well as the men’s race. We were using the Mentmore course, incorporating a long straight drag, which on this occasion was into the wind, followed by a climb up to Mentmore. For the men there were 12 repeats of this, covering 80 kms (50 miles), while the women had 10 laps, or 70 kms. All of this was undertaken in very warm conditions. A full field of 60 riders had entered the men’s race, which got underway at 9.30 in the morning, although there were a few no-shows on the day. 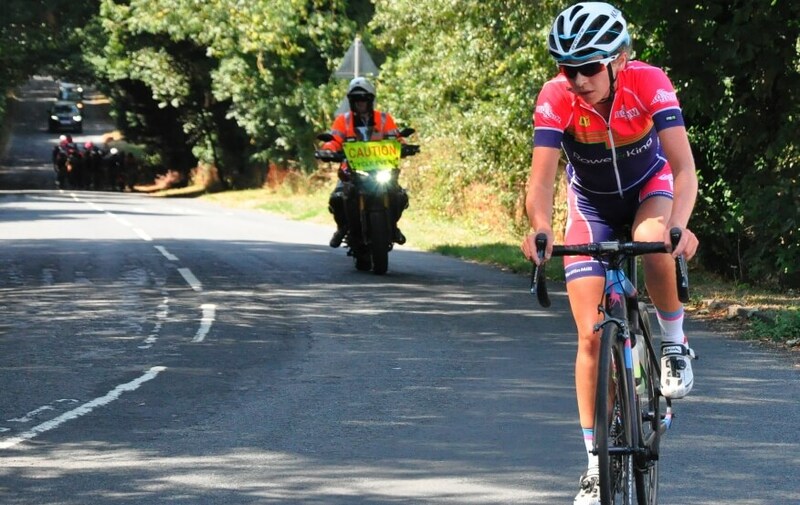 Click here for race results on British Cycling. Hugely disappointing was the wheel failure experienced by our own Simon Pearce. Fortunately it let go in the HQ car park as riders lined up behind the course car. The loud explosion as the wheel rim literally blew apart took everyone in the vicinity by surprise, and although Simon was disappointed not to be able to take the start he must have been counting his lucky stars that it didn’t happen on the 40 mph descent out of Mentmore. 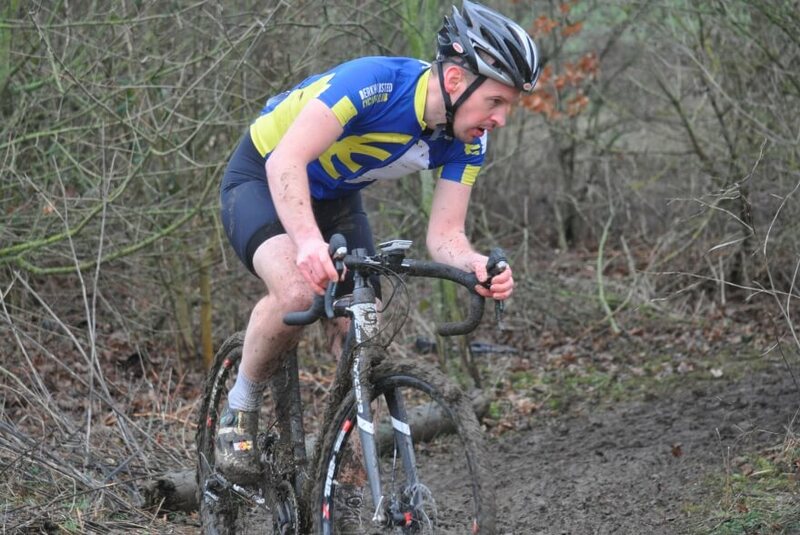 Further bad luck afflicted another BCC member, James Burke, who punctured on the first lap and had to abandon. 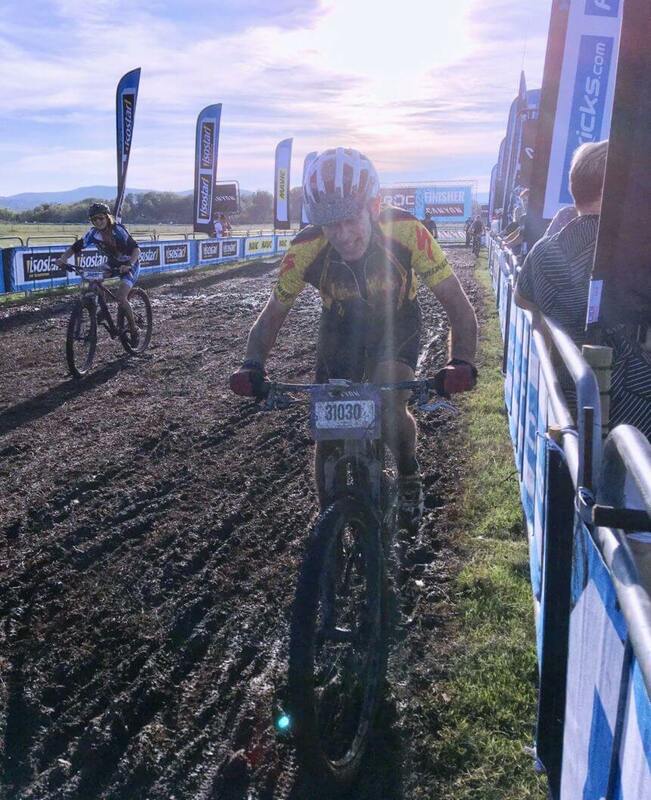 Apart from those misfortunes we did see four of our riders cross the finish line, with James Taylor heading Matt Buckle, Ben Nixon and Rob Morton. 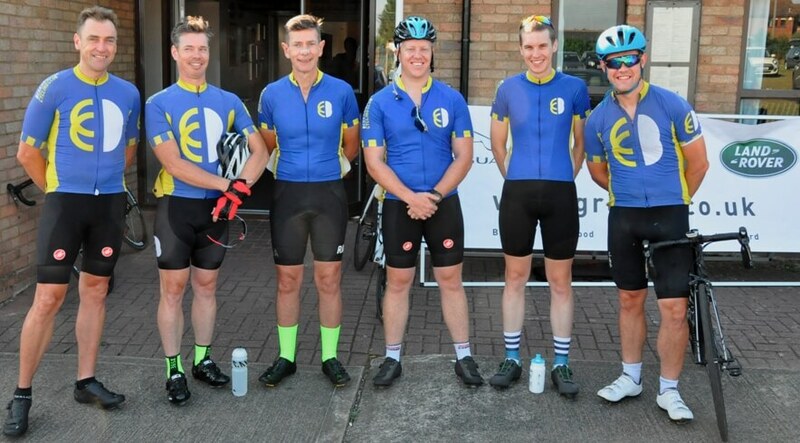 Our Cat 3 riders, James and Matt, did a superb job, staying with the pack until the finish line, while Ben and Rob had their own battle within the 4th Cat entrants. 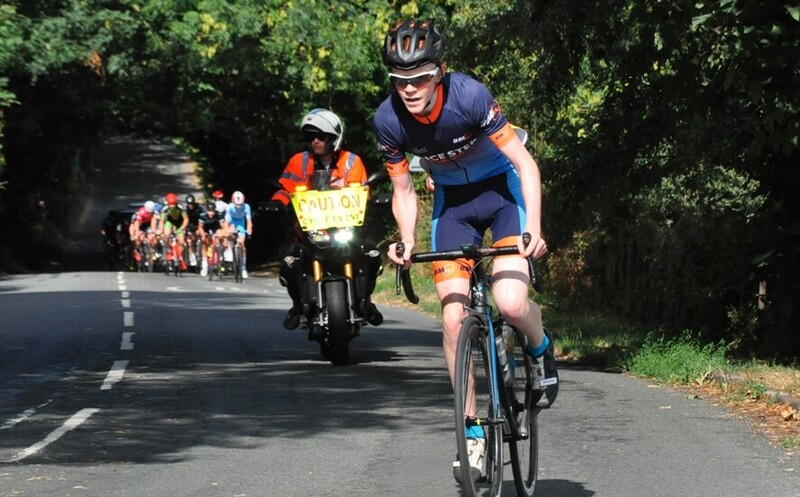 The hotly contested race finally saw Richard Wiggins of Team Milton Keynes emerge victorious, followed by Cian Smailes of NFuse Identity Racing and Joe Baker of Zero BC Development Team. The afternoon brought the ladies to the start line, and this was always going to be a very serious field, with cats 2, 3 and 4 competing for honours. 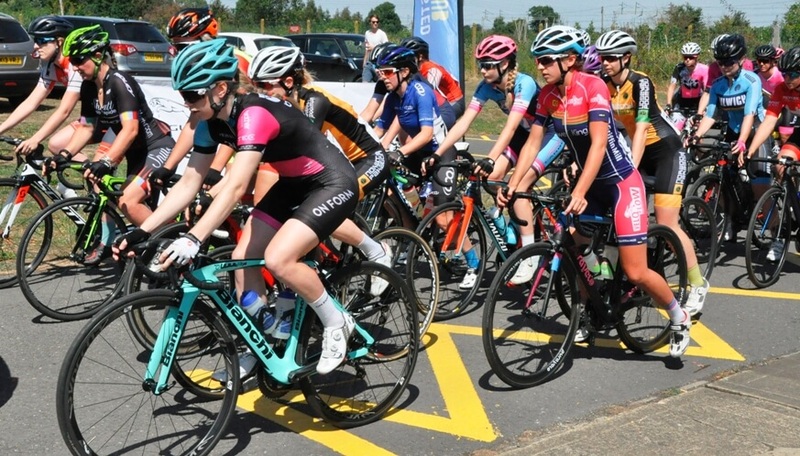 The main pack stayed together for the whole race, with Georgia Bullard of Team Jadan Weldtite – Vive Le Velo crossing the line first, followed by Charlotte Redden of Cycle Team On Form and Francesca Cutts of CC London. 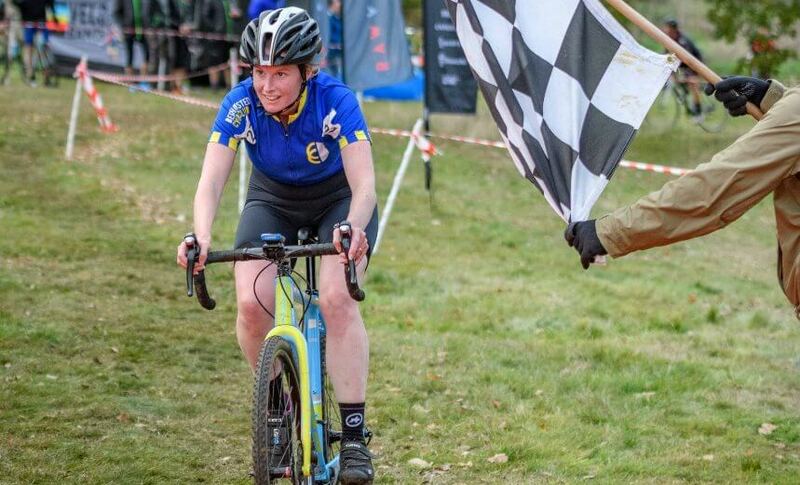 Both races saw great sprinting for the primes, and when the results were finally established it was enormously gratifying to see that BCC’s Janice Bell had won the Cat 4 competition. From all the positive remarks and compliments from competitors, with many expressing their wish to compete again next year, I think we can say the event was a great success. 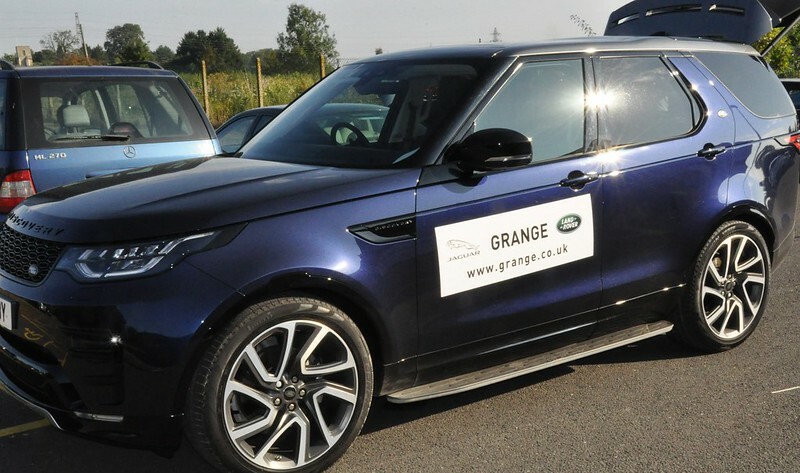 BCC would like to express their thanks to Grange Jaguar Land Rover, who supported the event and supplied the course cars. 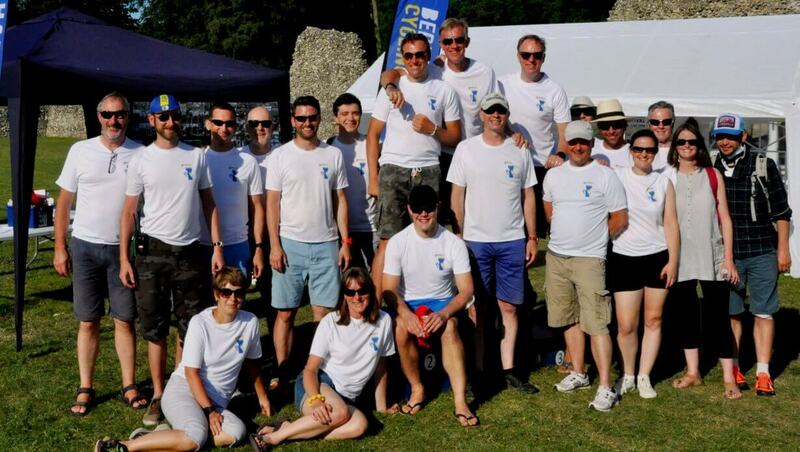 The club also wishes a huge THANK YOU to the volunteers, marshals, British Cycling staff and our Performance Officer Graham Earl as without these people the race would never have happened. You are all winners!